I believe this is the last holiday wreath that I needed to make! I have one for all of the other holidays and seasons, and sadly this beautiful Easter egg wreath kept getting push back on my to-do list. I bought the supplies maybe a year or two ago but wasn't able to get to it until now. I wanted to keep it simple with just a few Easter eggs and flowers, I even bought an oval wreath that was slightly egg-shaped. I glued some of the longer flowers in place before adding the Styrofoam eggs. Next, I added a few more longer flowers and filled in with the smaller ones. I completed the wreath with a big pink and white gingham bow. 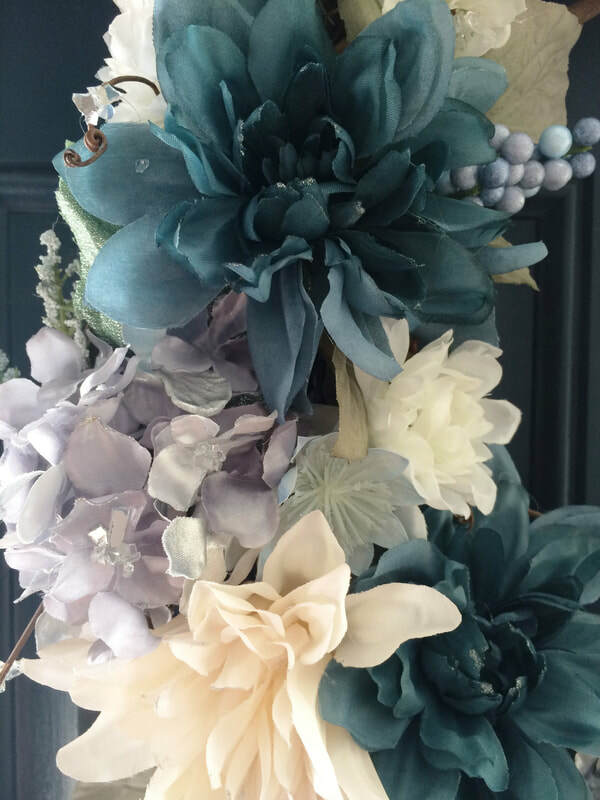 The pastel colors on the dark-colored wreath is so simply elegant and perfect for springtime! Well, this cake tested my artistic talents! It turns out that I really don't have any, but I am great at looking like I do! 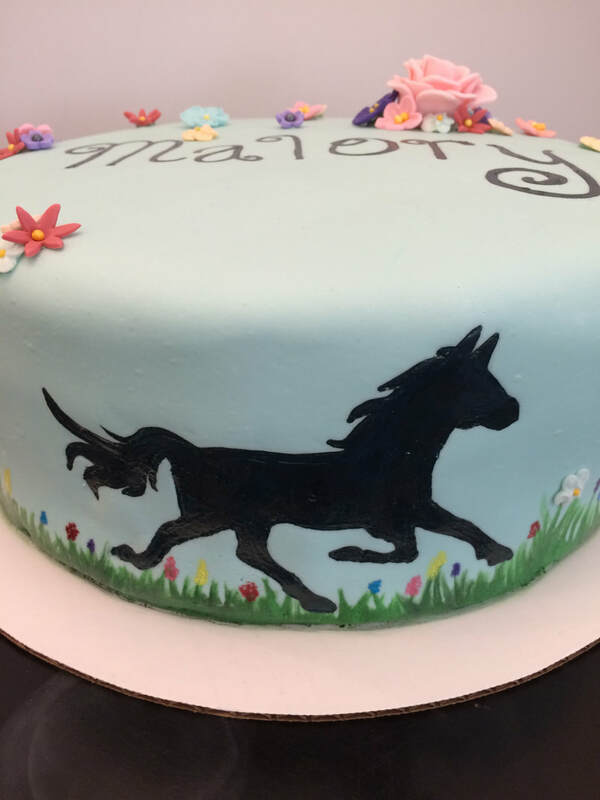 The horse on this pretty cake was actually a cut out of an outline of a horse and then traced on the cake using a detail knife. 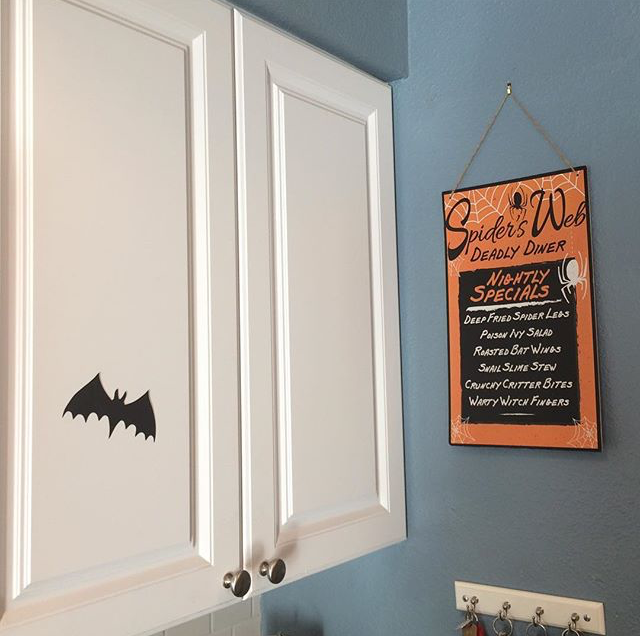 I then painted the silhouette using black food coloring and white writing icing. 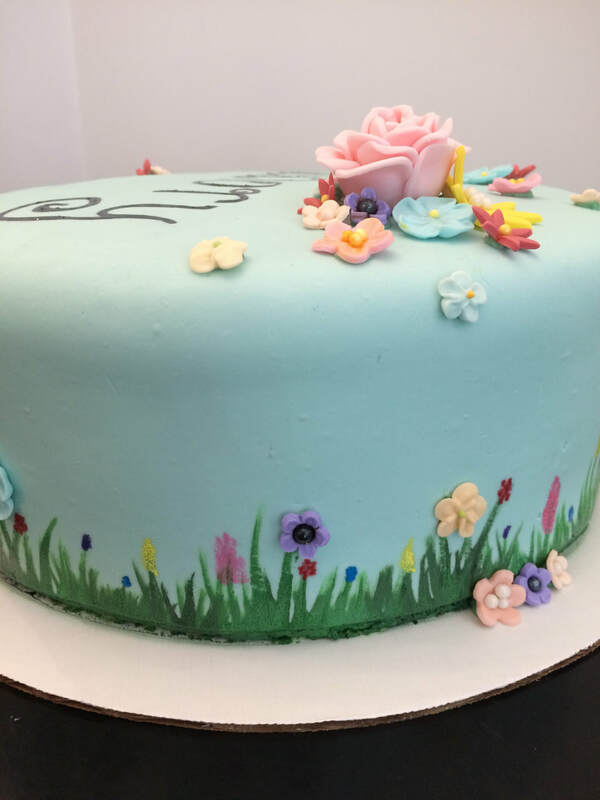 I used the same writing icing mixed with other colors to create the grass and painted on flowers. The other flowers were made from fondant and gumpaste with little sprinkles. 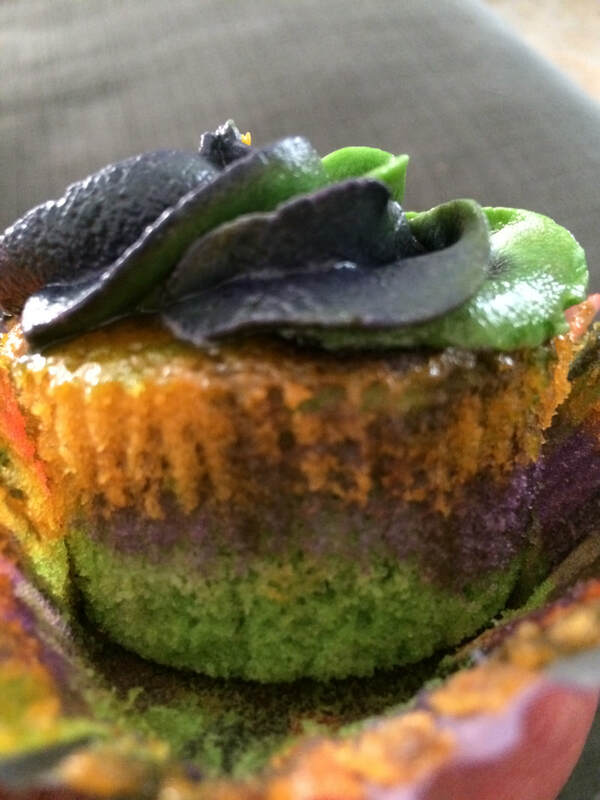 They were placed along the top of the cake around her name and on the painted grass using sugar water. All though I never could have free hand painted this cake, I couldn't be happier with how great it turned out! It’s hard to believe that this was my first opportunity to make a marble cake! This cake is so beautiful, simple and elegant and the best party was the colorful surprise inside! 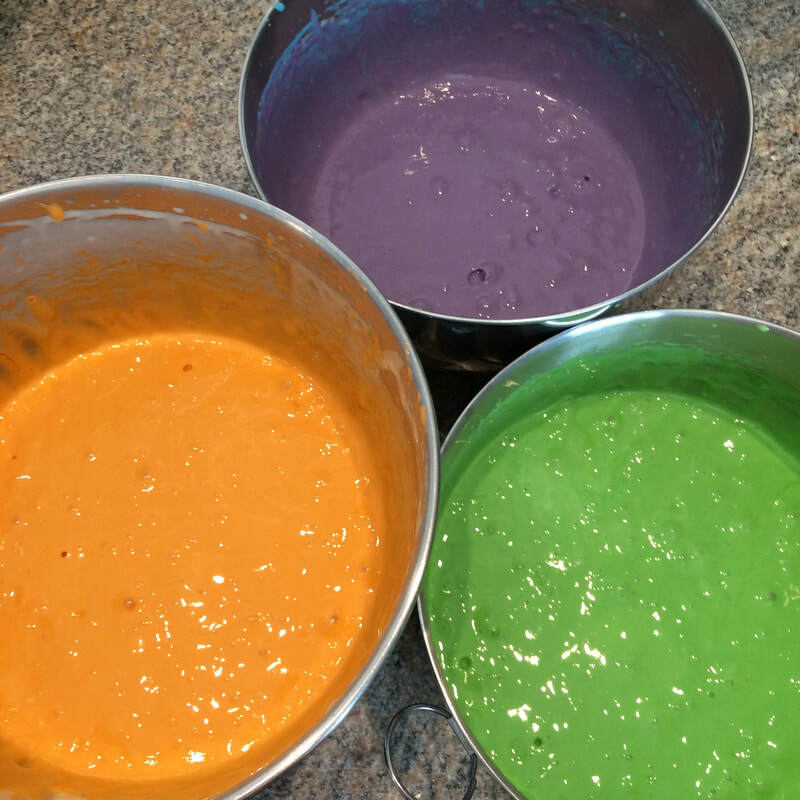 The cake consisted of six thin layers of French vanilla cake; each colored a different color of the rainbow. The six layers of cake made each tier abnormally taller than no normal, so next time I think I am going to make the cake layers even thinner. The taller tiers did give the cake a really regal look. ​Although the cake decoration was simple I struggled with creating the marble look. 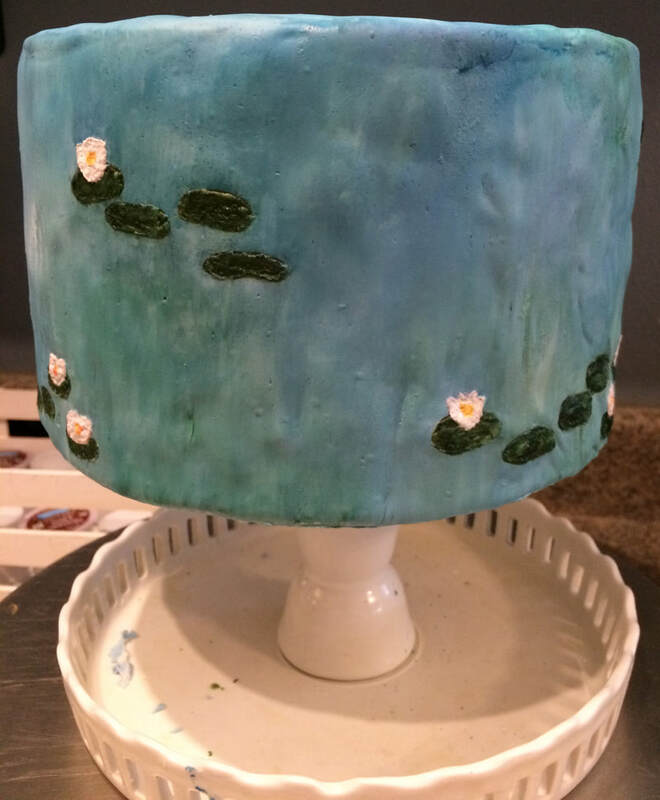 I ended up having to put two layers of fondant on the tiers! The first layer ended up being more solid grey than marble after being rolled out and smoothing it on the cake. 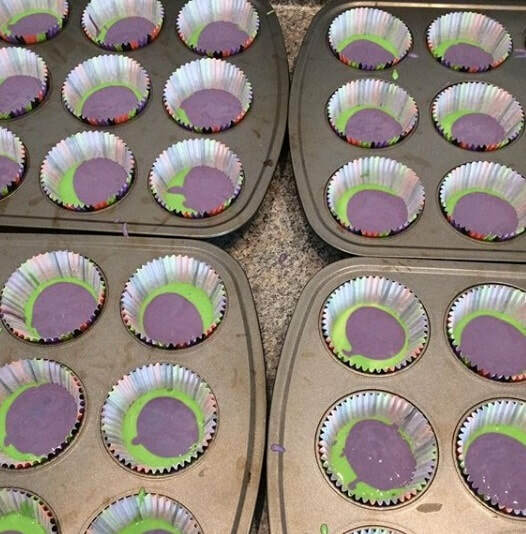 When rolling out the second layer of fondant I added less black food coloring to help prevent it from turning out all grey again. The second layer came out much better and I was happy and relieved that I made the decision to redo it! This might be my favorite holiday wreath I have ever done! 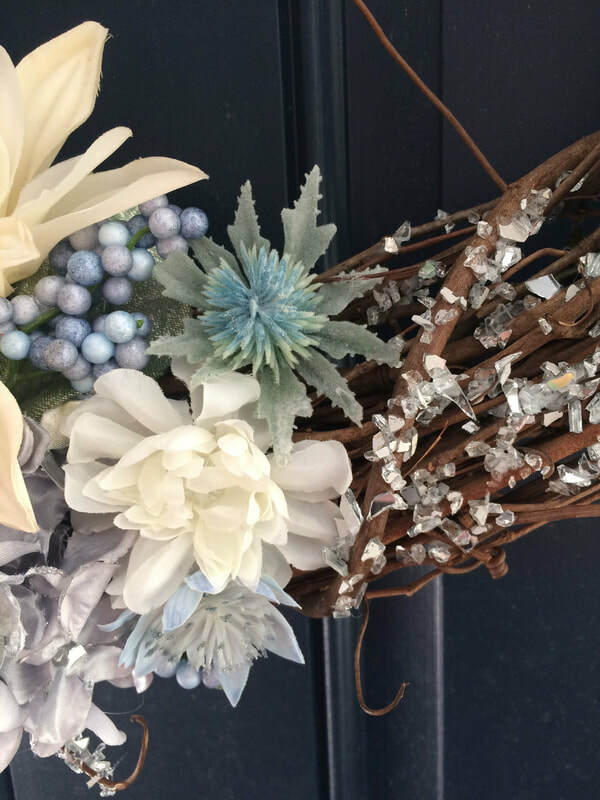 I have made several holiday and seasonal wreaths in the past, including this beautiful winter inspired one last month. In fact, when I getting the supplies for the winter wreath I picked up the flowers and grape wreath for this one since I knew I was going to need a St. Valentine’s Day one. 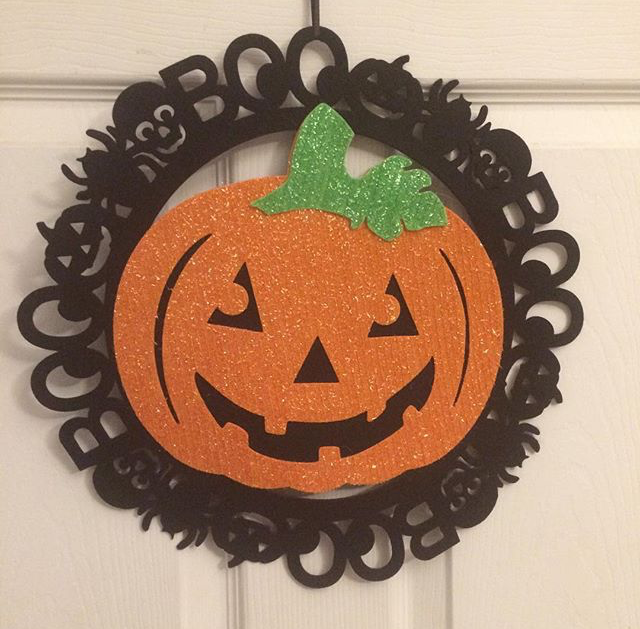 The total cost of the wreath was only $10! The grapevine wreath was $9.99 that I used a 40% off coupon on, the flowers were on sale for $5 and I got to use an extra 25% off on the grand total! I love a good deal. I did this wreath in a rush, but for more of a step by step guide on how to make your own, you can click here. I first shortened all of the stems on the roses and leaves and moved them on the wreath until I got the look I wanted. I then removed one flower and hot glued it in place and repeated until all of them were glued down. When I held it up I thought it was missing something and after searching through my St. Valentine’s Day storage bin I found the really pretty felt heart. I glued the heart in place and added the bright pink ribbon for an extra dash of color to hide the hook from the wreath holder. I love how beautiful and elegant it turned out. It such a subtle way to decorate for the holiday of love! 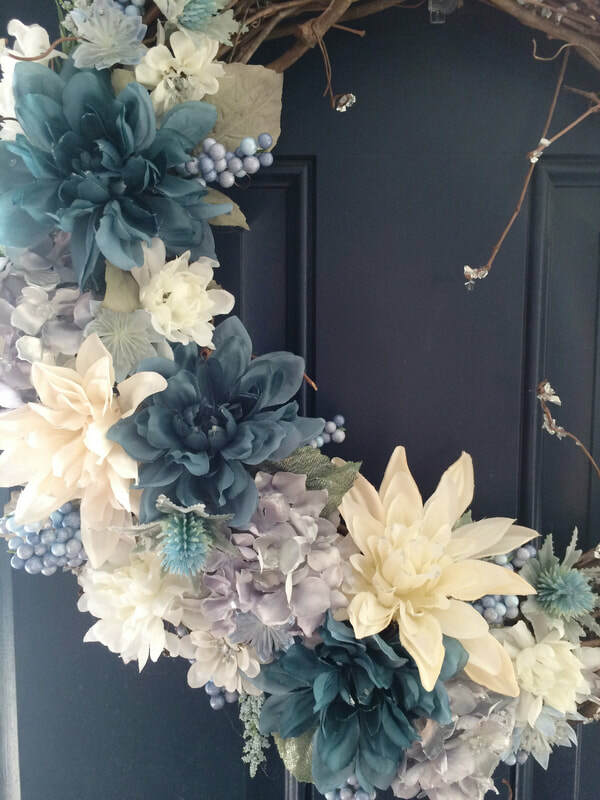 This beautiful winter wreath was inspired by an episode of Home & Family on the Hallmark Channel. On the episode, they were making snowflake wreaths out of white Christmas lights and paper dollies. They were really pretty; but just not my style. However, it did make me want to make my own winter wreath, especially now that my house was suffering from post-Christmas plainness. 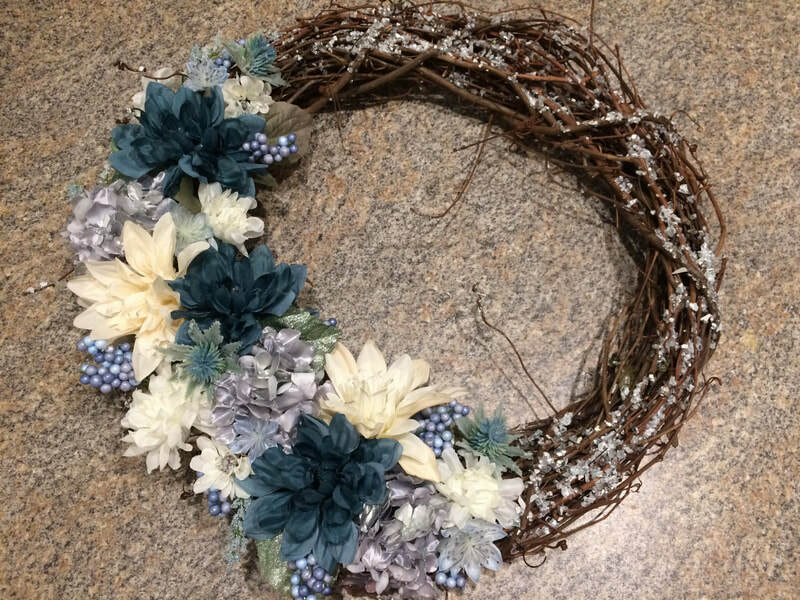 I purchased the grapevine wreath for a few dollars at a craft store along with winter-inspired colors. I chose shades of white, blue, and a few silver flowers. I also leaned towards flowers that reminded me of snowflakes. While I was also there I picked up some silver glitter paint and a container of mirror chips that is decoration filler. The filler is normally used in flower vases, but I had a different idea in mind. I cut down all of the stems on the flowers and placed them all in a pile. I picked some of the bigger flowers and placed them on the wreath. I then filled in spaces with smaller flowers until I had the full look that I wanted. After I glued all of the flowers and leaves in place, I painted the tips of some of the flower petals with the silver glitter paint. The glitter made the flowers look like they were touched by Jack Frost or Elsa. 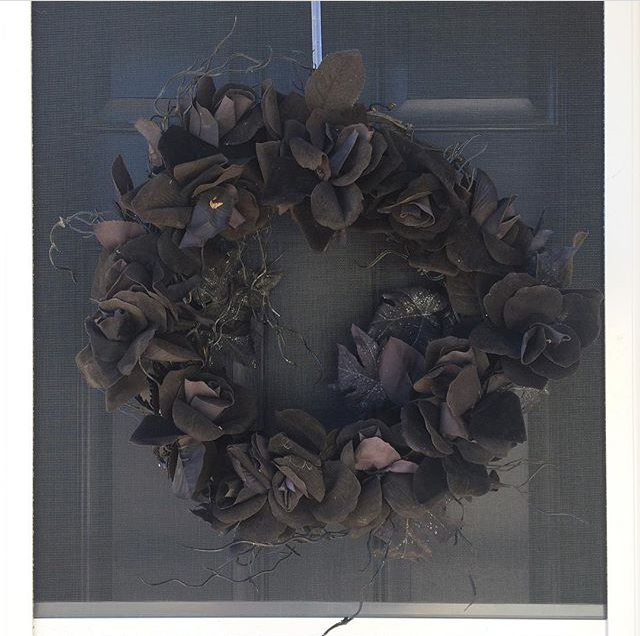 ​Lastly, to complete the winter look I glued the mirror chips all along the wreath. I didn’t use hot glue for this part, just regular craft glue. 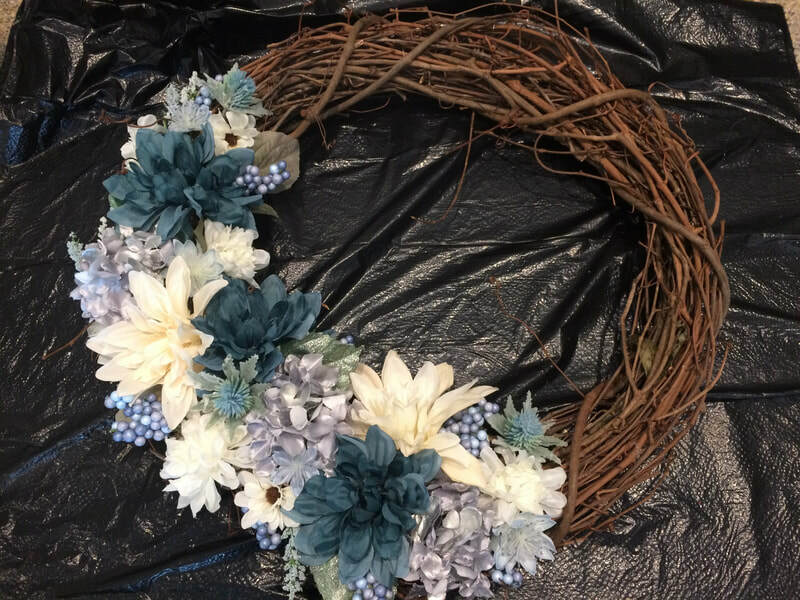 I placed the wreath on a large trash bag and then squeezed the glue on any part of the wreath that I wanted to have the mirror, including the center of a few of the flowers. 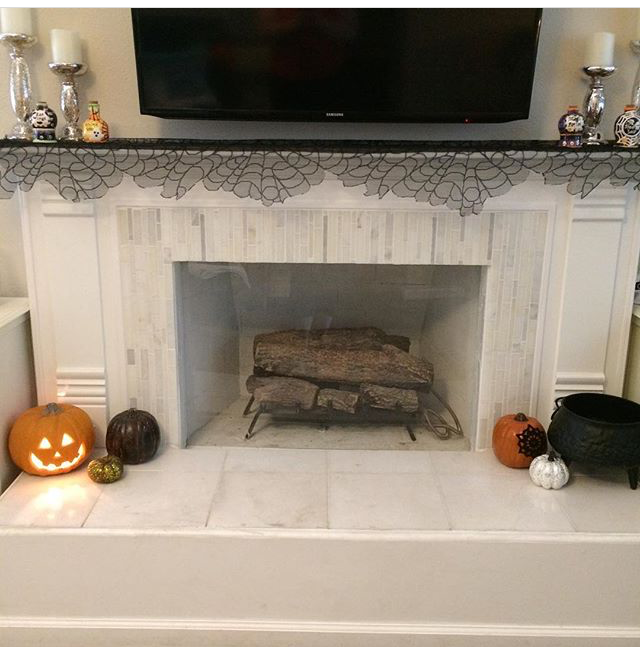 Next, I sprinkled the mirror chips all over the glue and didn’t move the wreath until the glue was fully dried. I couldn’t be happier with how beautiful my winter wreath came out and how the mirror chips look like ice crystals! How do you even begin to take down the Christmas decorations that took you several days to put up, oh and you decorated every room of your home? One bite at a time… The first thing is to turn on your Christmas tree lights. It will be the last you will get to see them for eleven months and they will help you keep a smile while taking everything down. The second thing is to break down all of the decorations into manageable sections. 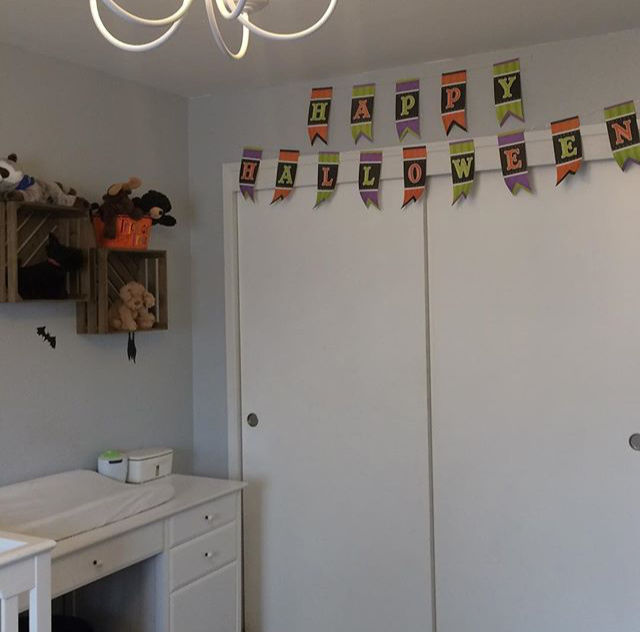 The first section I tackled was grabbing all of the blankets, pillows, aprons, tablecloth, towels and holiday clothes that will be stored in the storage bins. Then throw them in the washer (if they are washable of course). 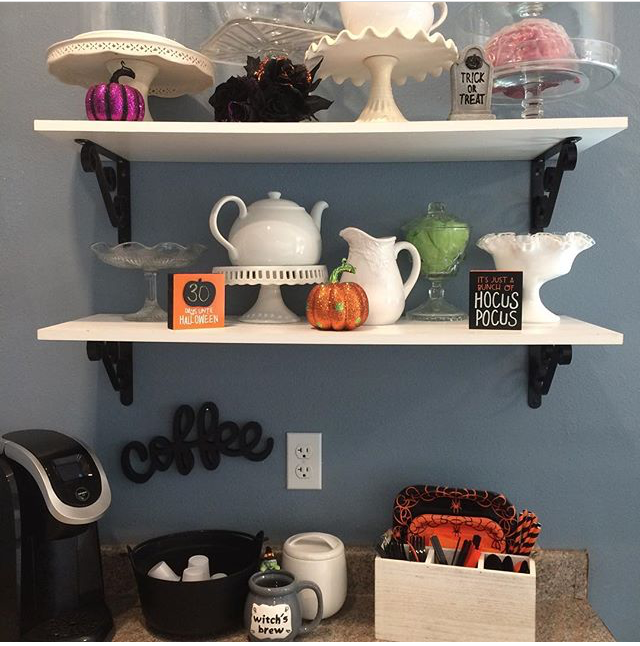 For the next section gather all of the dishes, glasses, coffee cups, and servings platters. Yes, even the specials cookie plate for Santa and put them in the dishwasher or wash them by hand. While all of these items are washing and drying, I gather all of the non-washable items like the tree skirts, stockings, Santa hats or any other fabric items that are not washable and store in large plastic storage bags. I reuse the same ones each year and just leave them in the storage bins. Once everything is in the storage bags I place them in a pile all together to easily grab to put in the bins as needed. 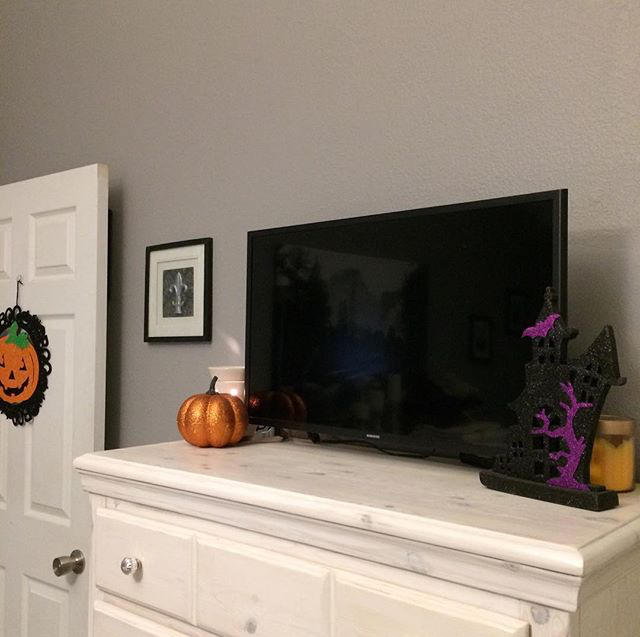 Next up, remove all the knick-knacks, figurines, plaques, signs, candles, books, advent calendars and any other décor. 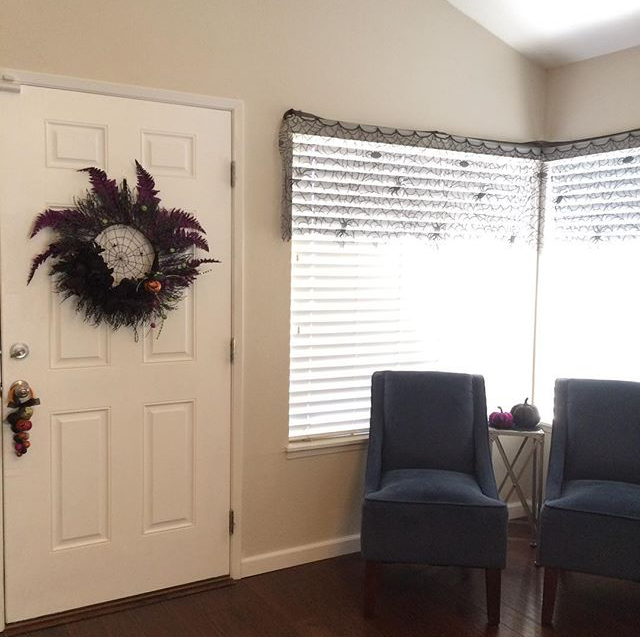 Including any garland and wreaths, you have throughout your home. Wrap them if they are breakable or store multiple items in a box. Place them in another pile until you are ready to put everything in the bins. Last up; remove all of the ornaments, lights, tree topper and any other items on all of the Christmas trees. Wrap and store glass ornaments, ideally in boxes or plastic bins for extra protection. My plastic ornaments are just placed in plastic storage bags. 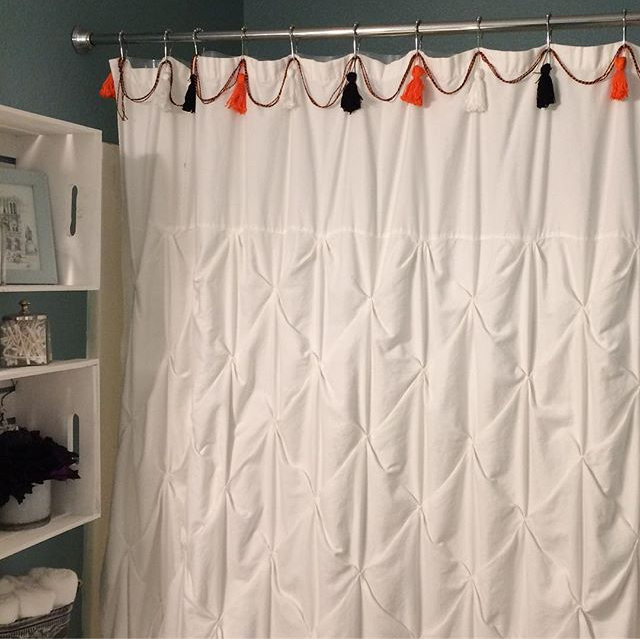 I also place the string of beads in a plastic bag to keep them from getting tangled. Make sure to secure strings of lights so they also don’t get tangled. Once all of the items are removed from the trees place plastic ones in storage boxes or bags or remove a real tree to be hauled away. By now all of laundry and dishes should be dried and ready to be put away in storage bags and boxes. 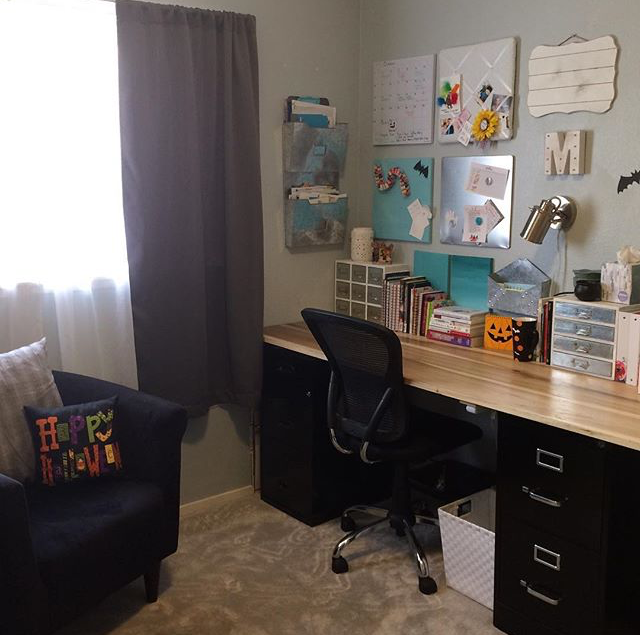 ​Now you are left with piles that need to be organized in the storage bins. I do prefer plastic bins over cardboard boxes; it helps prevent water, rodent and other damage. I start by putting any boxes in the tubs since they are usually the largest items. I next fill in the spaces around the boxes with the storage bags and any other items. 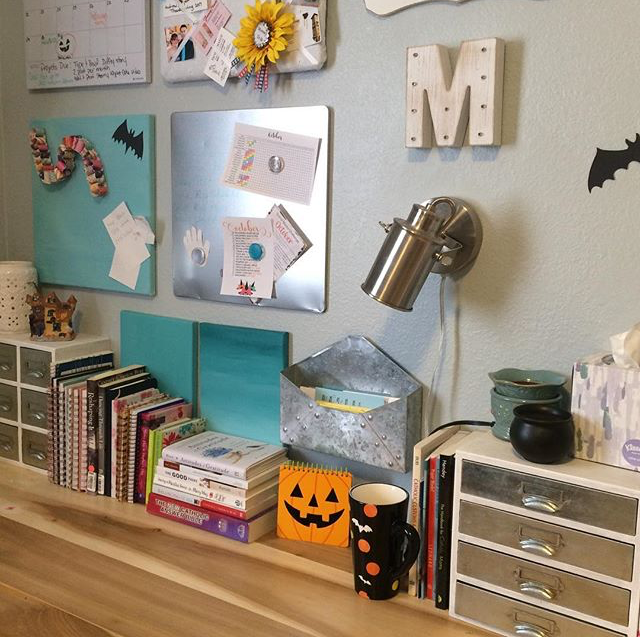 This usually takes a few tries to get everything to fit in the bins, but once it is finished and the bins are placed back in the shed or garage your home will be suffering from its post-Christmas magic. 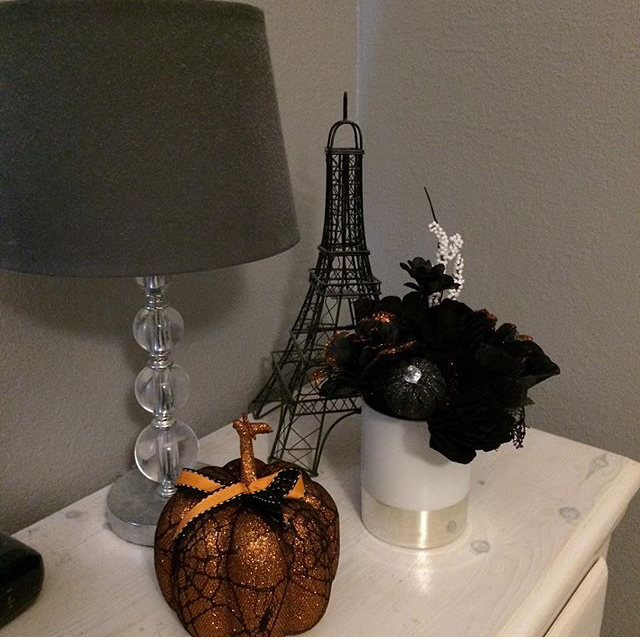 Sadly, this always makes me sad until I realize I have whole years’ worth of holiday decorating to look forward to! Last night I found out one of my cousin that lives out of state would be coming to another cousin’s 30th birthday party that was tonight. I haven’t seen this cousin since they have had their second child and part of my tradition is to make a blanket for all of my second cousins. 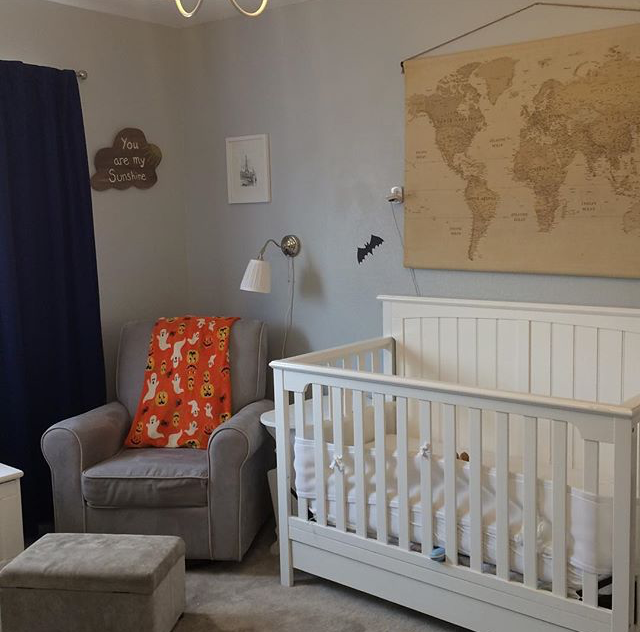 Their first son got this really cute western quilt, but I was in serious time and budget crunch this time around! I figured the best option would be to do a quick applique blanket. I looked through my tubs of fabric and found some really cute green striped flannel fabric and I just happened to have a soft baby blanket in my future project bin. I always love to pick up these blankets from Ross for quick DIY baby gifts for things just like this. I decided to keep the blanket simple and just go with a capital “W” for his first and last name. 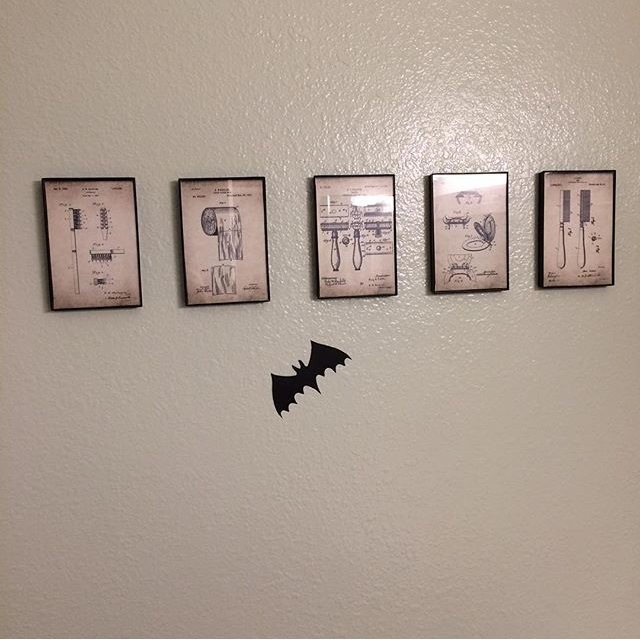 I printed out a few “W” using different sizes to choose from and went to work. I used Heat N Bond Iron-on Adhesive to glue the cut out “W” to the baby blanket before using my sewing machine to sew it in place. I know I didn’t need to sew the letter in place with the iron-on adhesive, but I like the little extra detail the stitches give the blanket. In under an hour, I had a perfectly adorable blanket to give to Wyatt! One of my favorite Christmas Day treats for as long as I can remember is good old fashion fudge. There was always a platter with this homemade sweet treat and I always managed to take a few extra pieces when packing up leftovers. I would look forward to sneaking a piece here and there usually all the way up to New Year’s Eve. Sadly however our Christmas gatherings have gotten smaller over the last few years and that means no delicious homemade fudge. 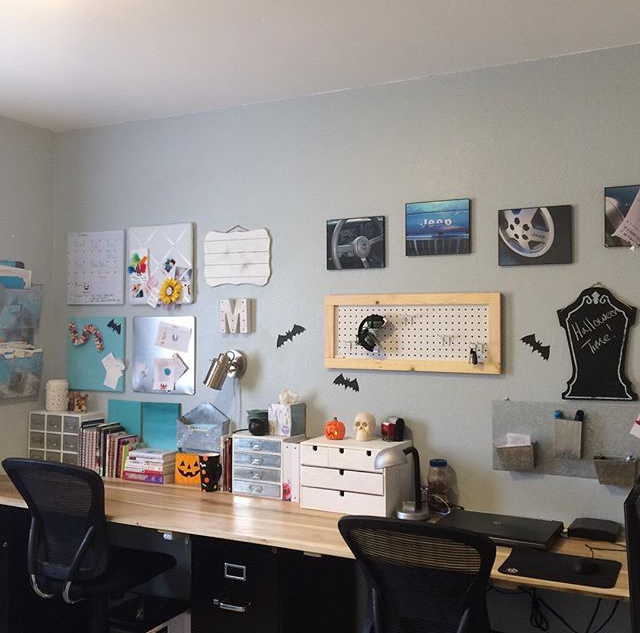 This year I decided to change that and make my own and I could not believe how easy it was! Don’t believe me? Its only two ingredients and only took five minutes…try it. I bet you will impress everyone on Christmas! Combine the milk and chocolate chips in a microwave safe bowl and microwave for 1 minutes. Remove and stir, if not smooth microwave for another 15 seconds, Repeat until completely smooth. Pour the fudge into an 8x8 pan lined with parchment paper. Spread it evenly and let it set in the fridge for at least an hour. Pick up the parchment paper from the dish and place on a cutting a board and cut into 1 inch squares. * If desired you can add 1/2 cup of walnuts by mixing in before spreading into pan. I can’t believe this adorable first birthday smash cake is for my little Andrew! It feels like just last month I was making the cake for my baby shower. 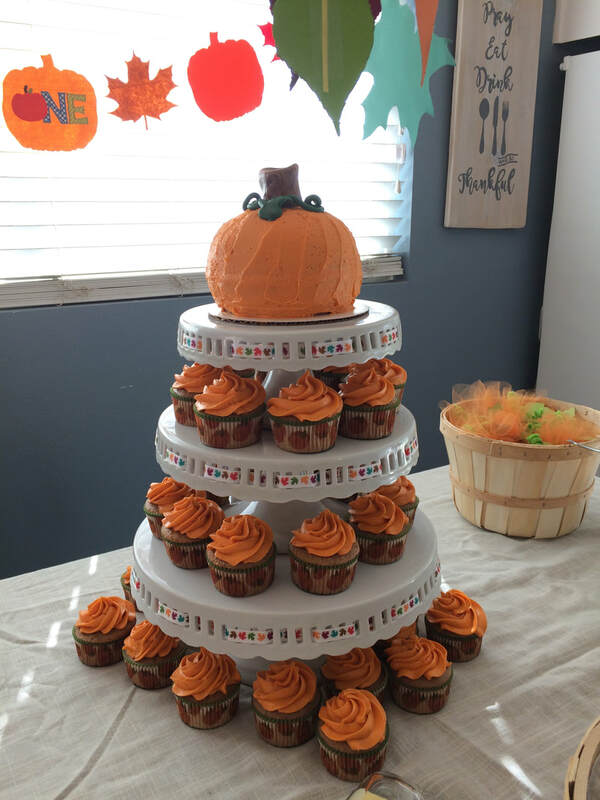 Since my little man is a fall baby and is my favorite season I thought it would be super cute to have his first birthday party be a little pumpkin theme. I will go over the menu and budget in a future post, but for now, let’s talk about his fun smash cake! Since I bake and decorate a lot of cakes Andrew is no stranger to the sweet treat. So, sorry no “healthy” birthday cake for him. Is there really such a thing as a healthy birthday cake anyways? Not only do they look gross, but they also don’t sound all that great either. It’s their birthday give them a real cake and I’m not talking about pre-mix over food colored sweetened frosting you find at a grocery store bakery either. Andrew’s cake was a simple vanilla cake with my delicious cream cheese frosting. I baked the cake in my dome cake molds to create the round pumpkin shape. I then colored the cream cheese frosting with all natural yellow and red food coloring that I found on Amazon. I filled the two domes with frosting and took a little off the top and bottom to make the ball shape look more like a pumpkin. I knew I wanted the cake to create a mess so I didn’t cover it with fondant, but instead covered the entire outside of the pumpkin. 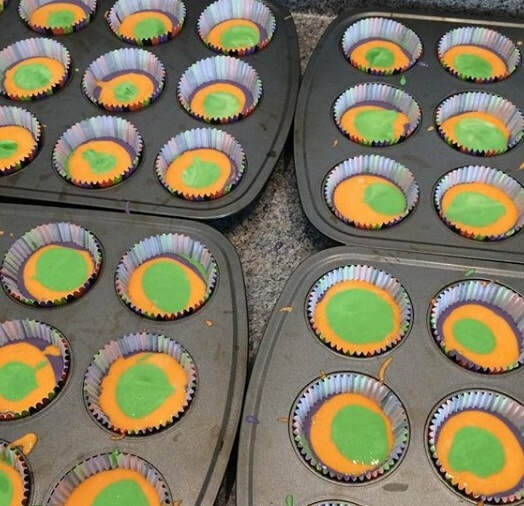 I created the groves of the pumpkin by using a frosting spatula to make lines in the frosting. 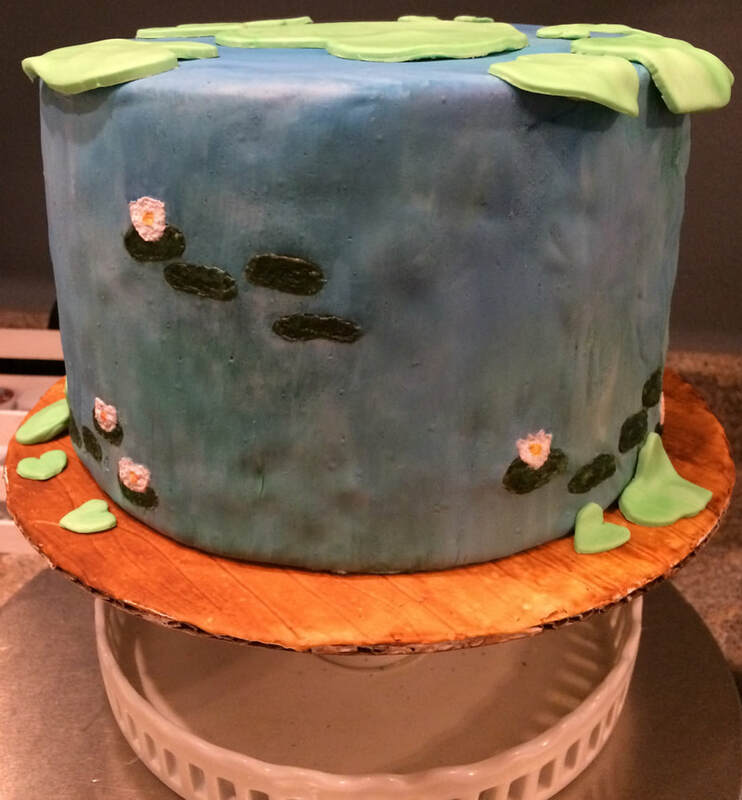 I topped the cake with a stem out of brown fondant that I didn’t blend completely to create the look of a real stem. I finished the cake off with a few green leaves and vines. It’s the perfect birthday cake for my little pumpkin! 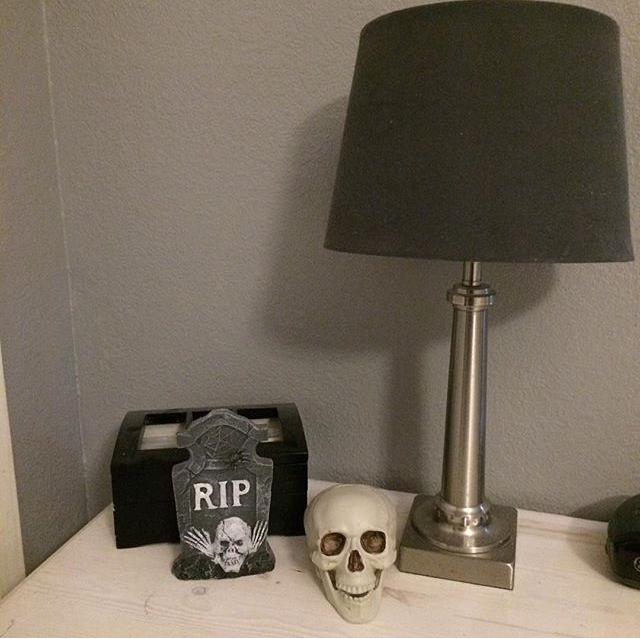 It’s Halloween time! 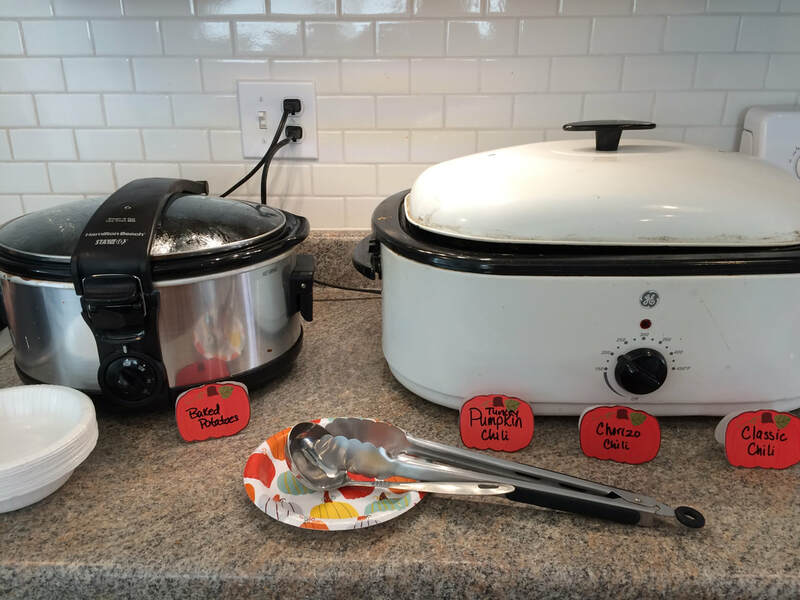 My favorite holiday and even more my favorite party we host! This will be our ninth annual Halloween party and Andrew’s first. 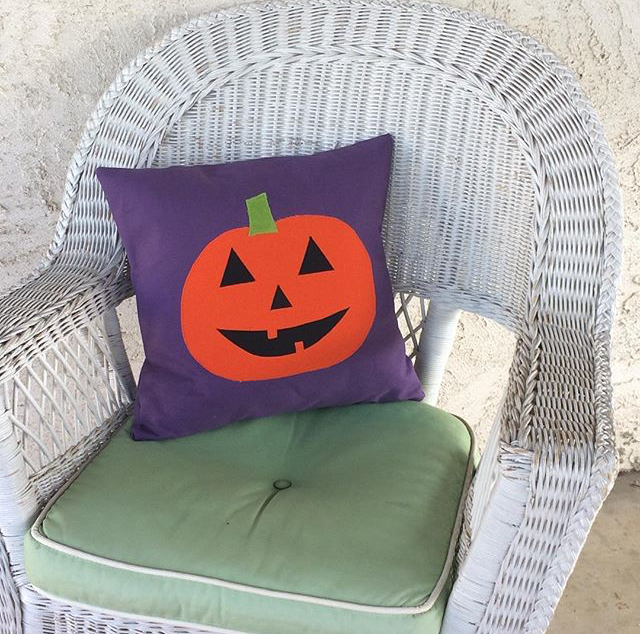 For this year party theme, I stuck with the classic Halloween colors: orange, black, purple and bright green. 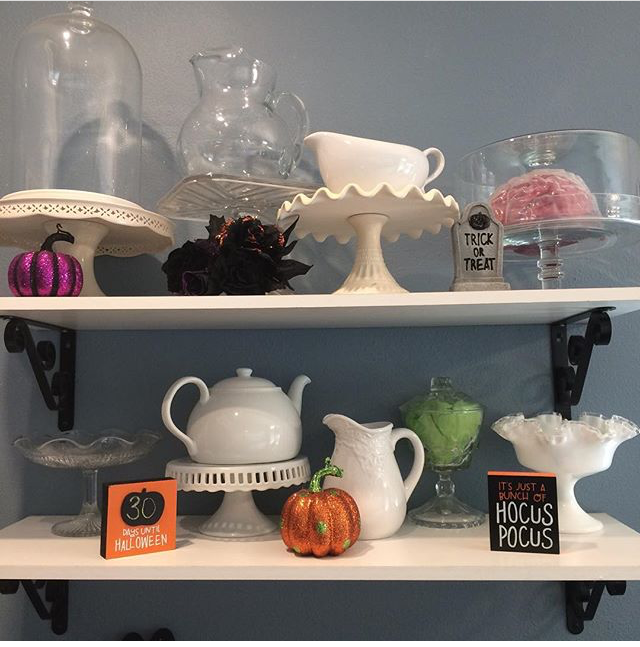 I found super cute plates at Hobby Lobby with all of these colors. 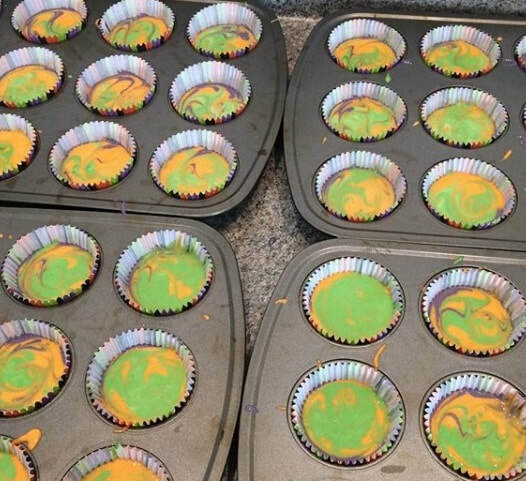 They even had matching cupcake liners. 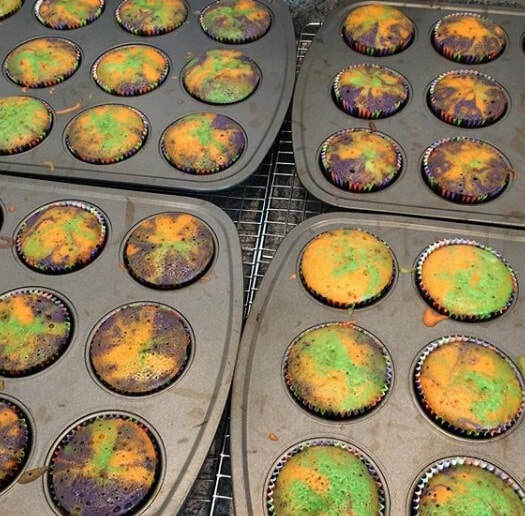 Once the cupcakes were baked and cooled, I frosted them using orange, purple, green, and black buttercream frosting. 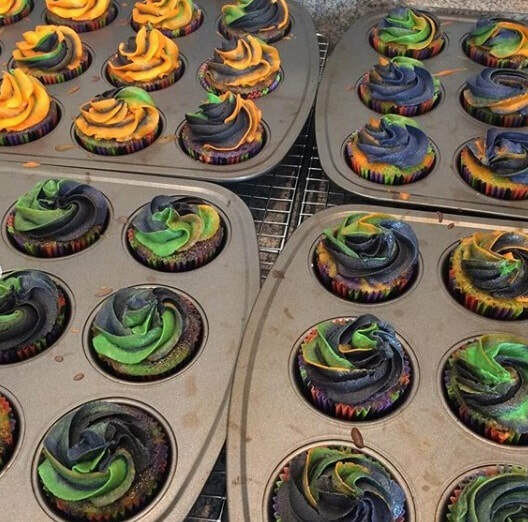 Actually, the black was made from chocolate frosting which gave the cupcakes a nice surprise. I placed each color in its own piping bag and then placed all floor in another piping bag with a large star tip. 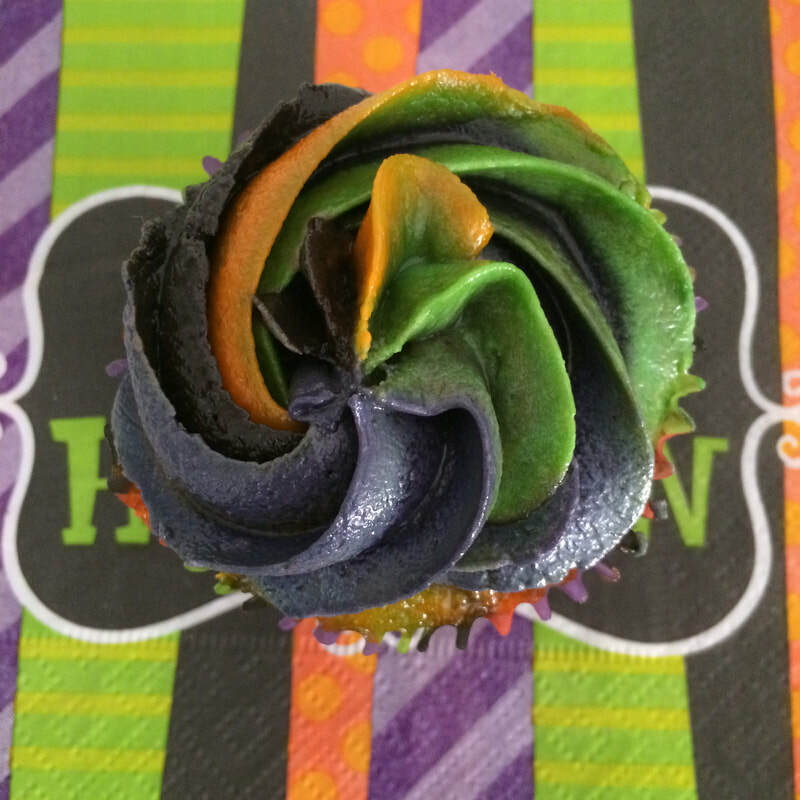 This created the perfect Halloween color swirl on every cupcake. I’ve done this technique before with two and three colors; but four was a little harder and lot messier. 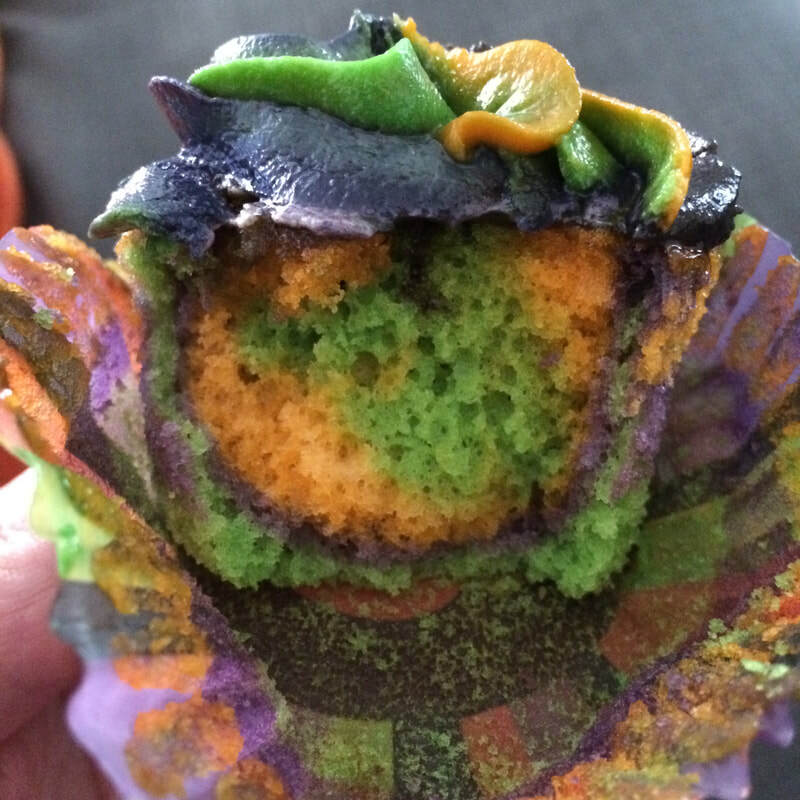 However, they came out perfect and even turned your tongue black and now that is the perfect Trick and Treat! 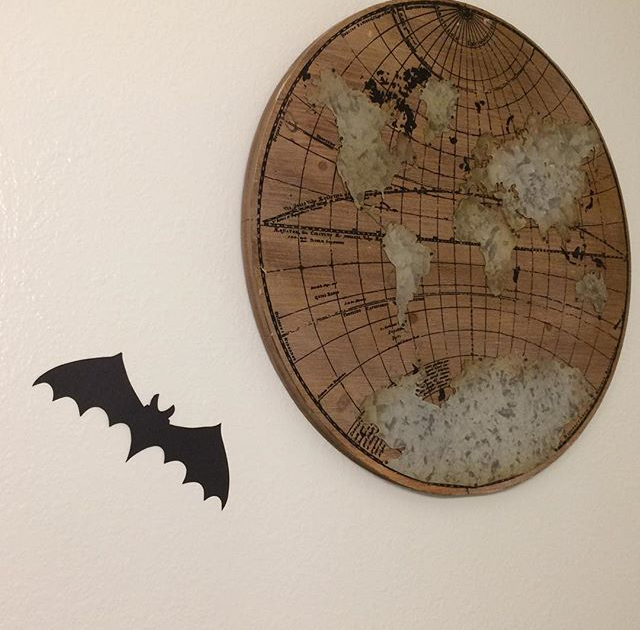 I might have gone overboard on decorating Halloween this year. 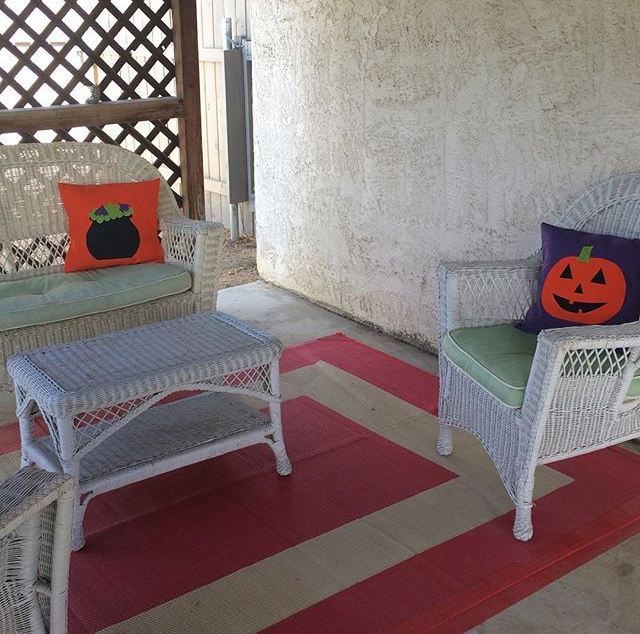 EVERY room in our house is decorated, even our patio! 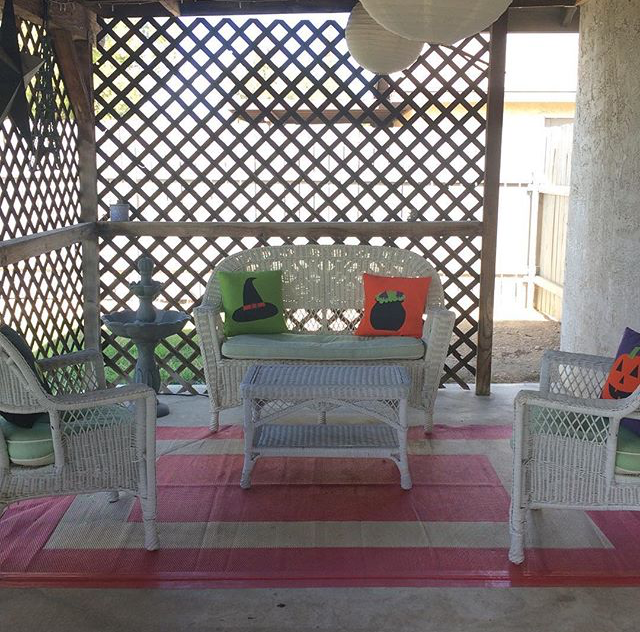 To be fair our annual Halloween party is mainly in the backyard and it makes sense it would be decorated there too. I love Halloween as most of you know and this is Andrew’s first Halloween which makes me even more excited this year. I tried to make sure nothing came off as scary, but fun and colorful. 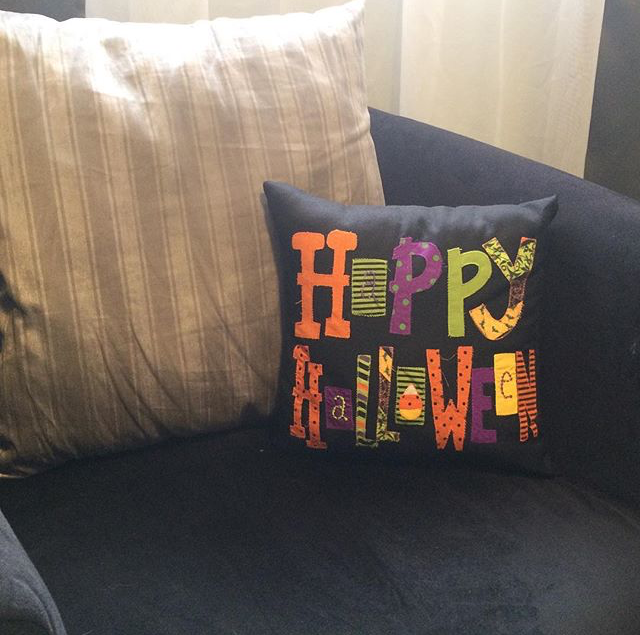 From homemade pillows. 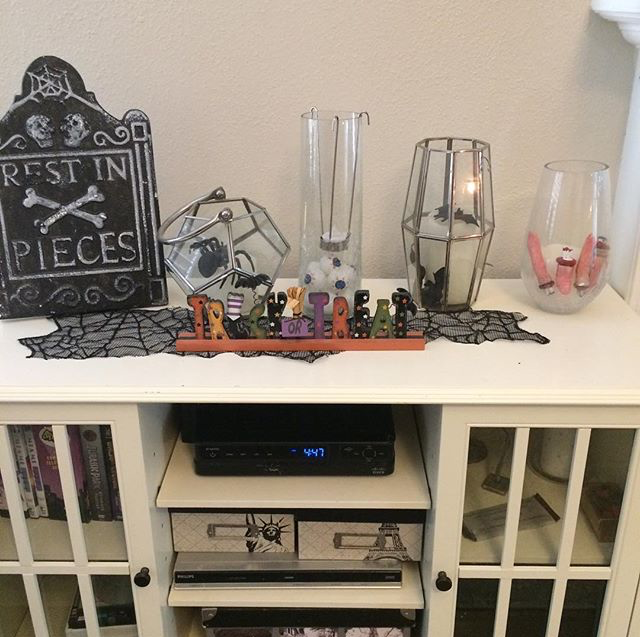 to cute Target and craft store finds, to all of the stuff I already had I went a little crazy. I could give Jack Skellington a run for his money. 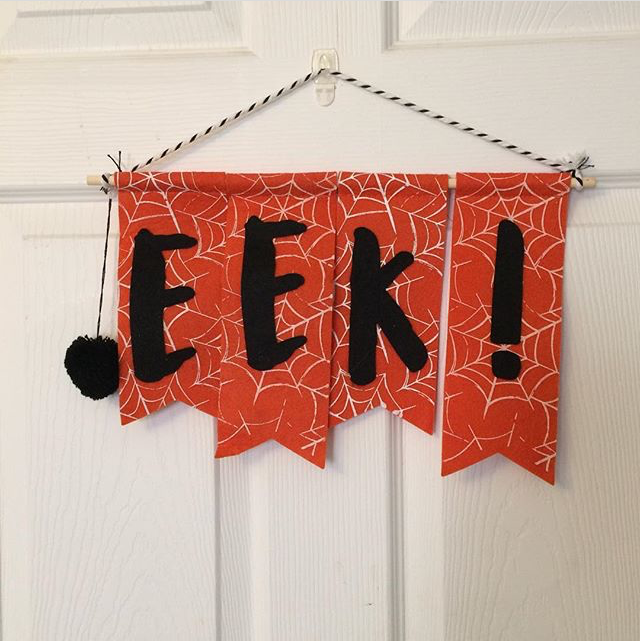 Check out the galleries to see all of the amazing decorations and for some future post on how I made specific items! 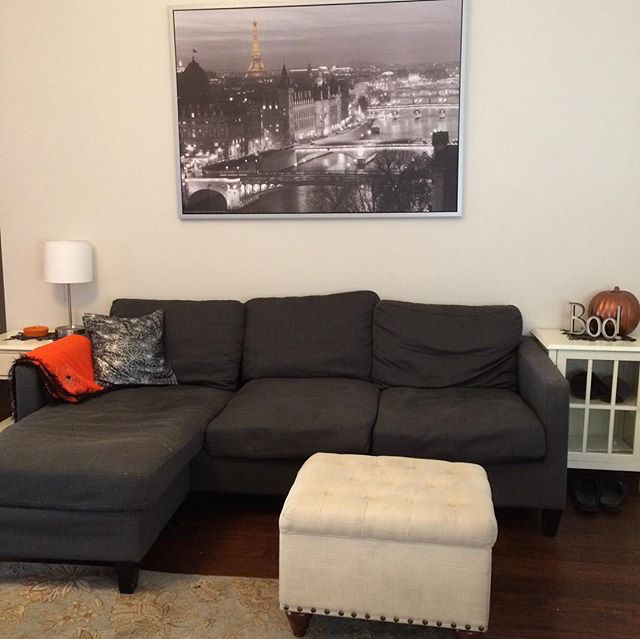 First up is our living room. 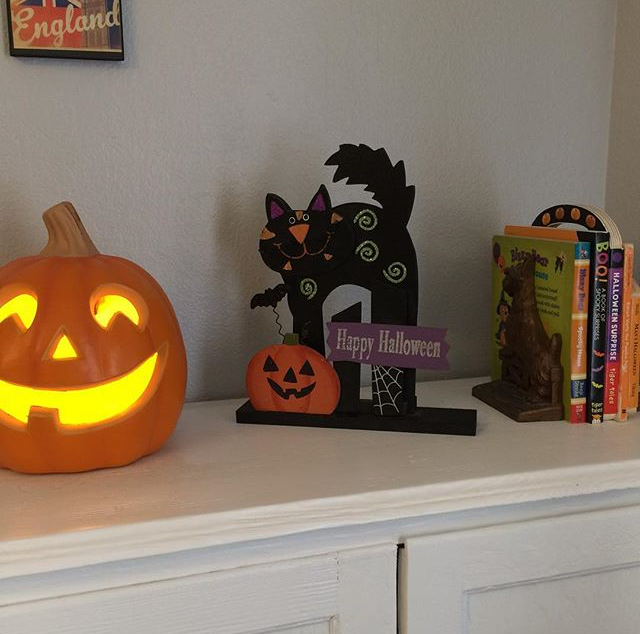 Most of these decorations I have had for years and look forward to putting them out every year! 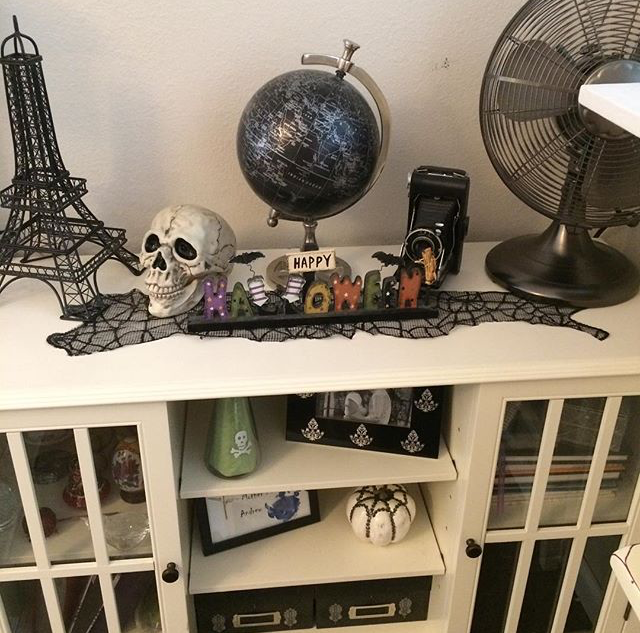 Most of the decorations were bought for only a dollar each. Can't be that deal! Andrew's room might be my favorite. 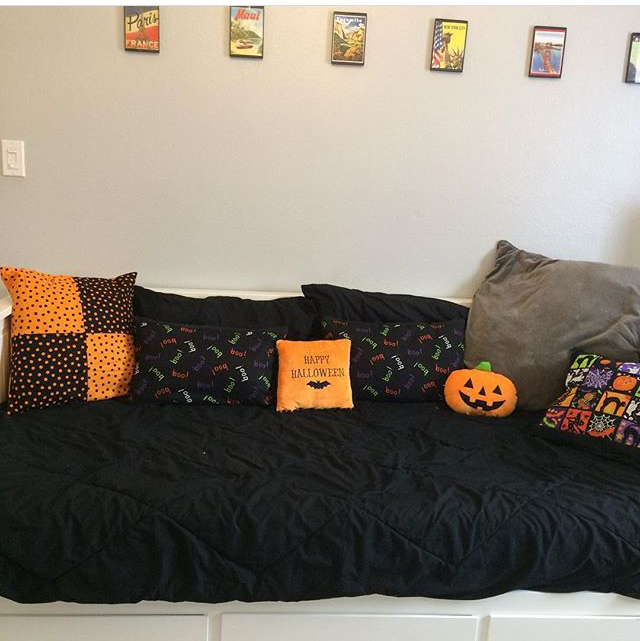 I love how the homemade pillows came out and look forward to reading him Halloween books while curled up under the blanket. 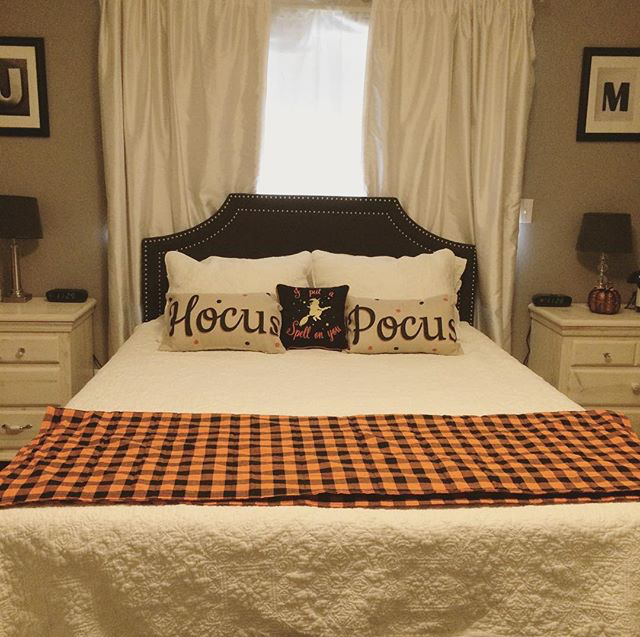 Our bedroom looks like it can be in fancy Halloween Hotel. 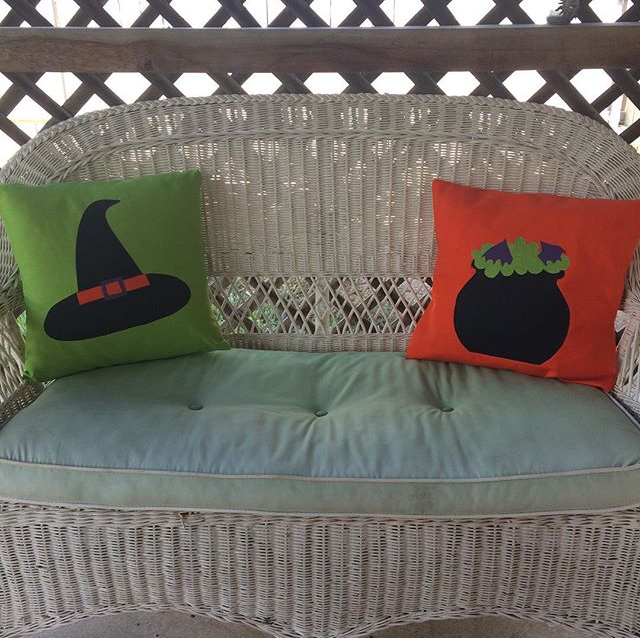 I love the perfect Hocus Pocus themed pillows I found on Amazon and a discount store. 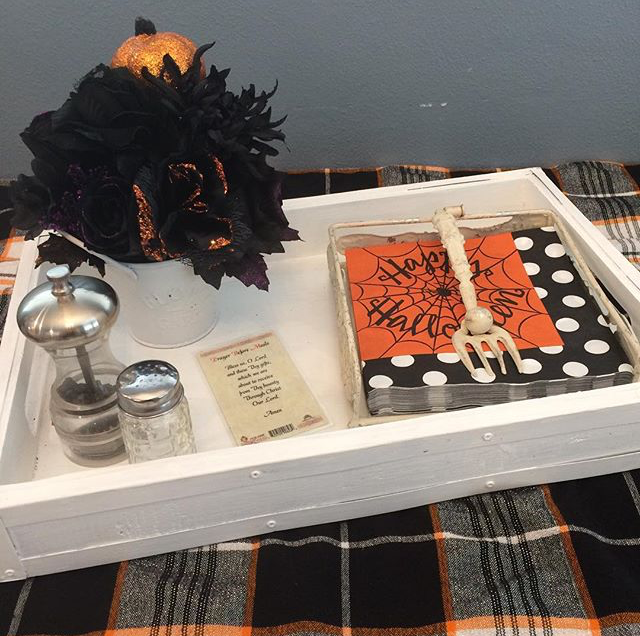 The blanket was made from a Halloween tablecloth I bought at Home Goods and added a flannel backing to, its perfect for a little extra warmth as the nights are getting cooler. 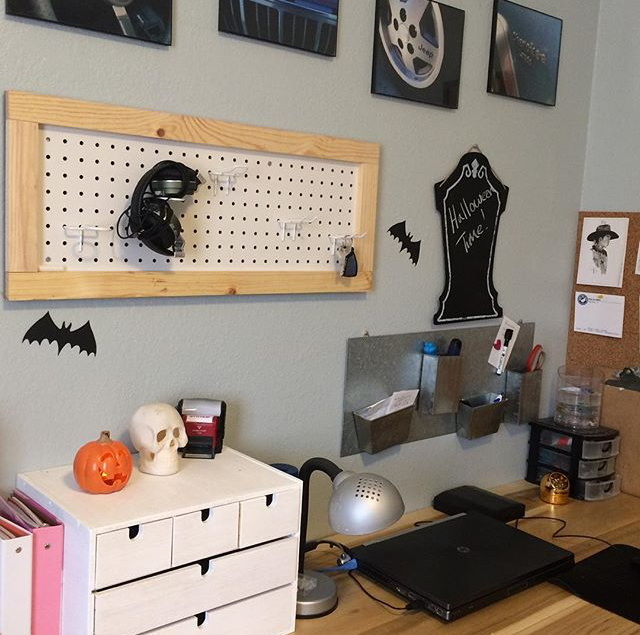 Our Office was kept simple with just a few decorations, just enough to make me want to go in there to work! 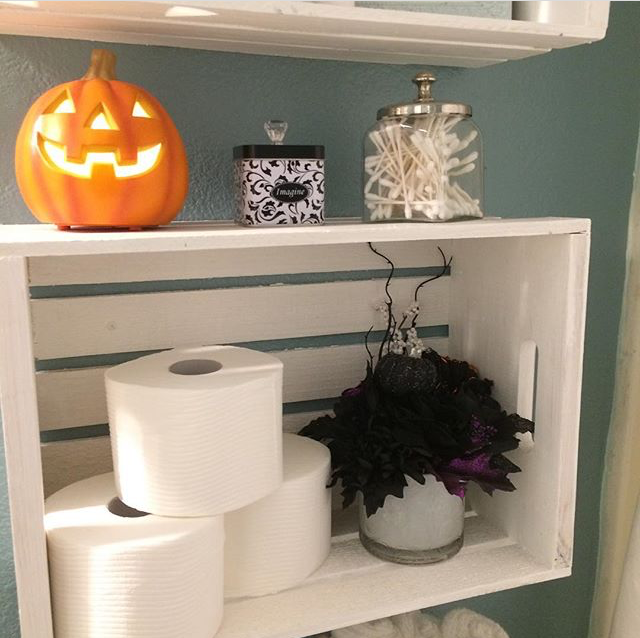 Even our bathrooms got a little decorations! 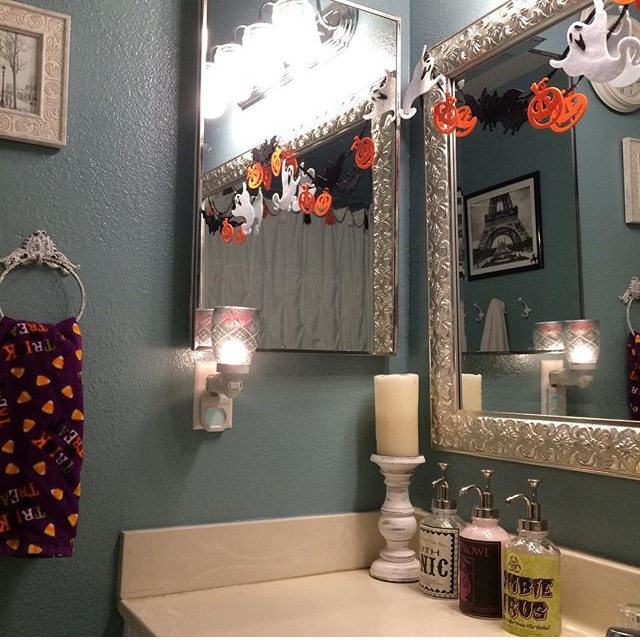 I made the Halloween garland on the shower curtain to match the garland on the mirror I bought at craft store. 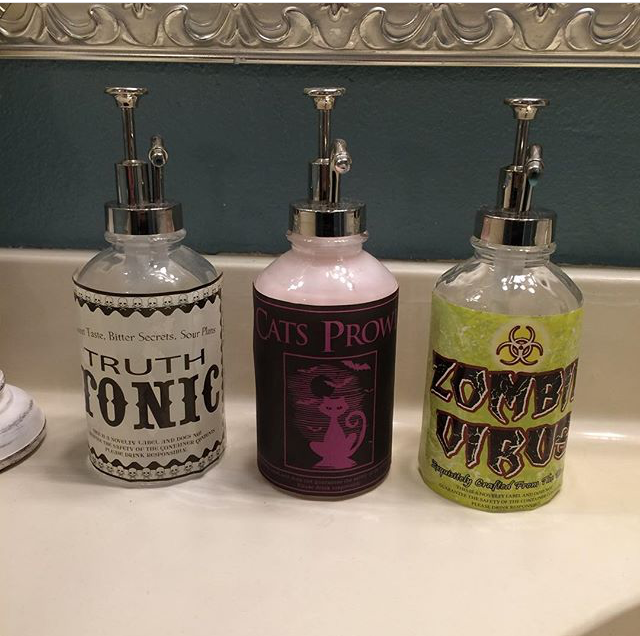 The labels on soap and lotion bottles were Halloween beverage stickers I've had forever and fit perfectly on them! 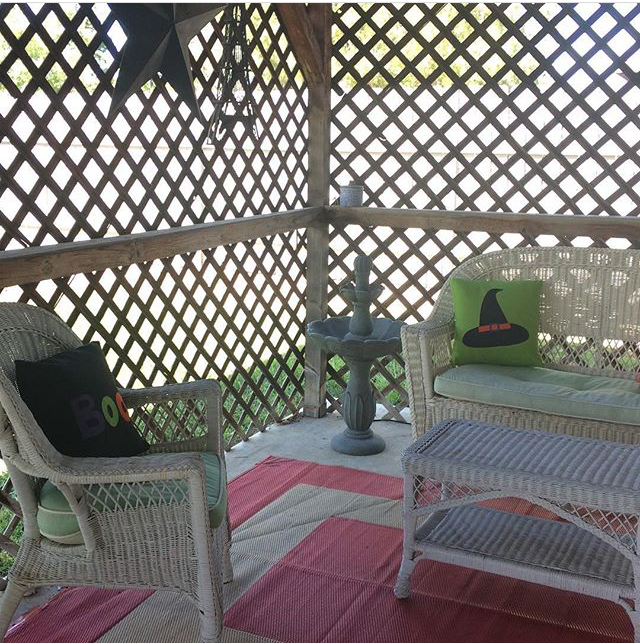 The patio was kept simple with just a few homemade outdoor pillows I made! 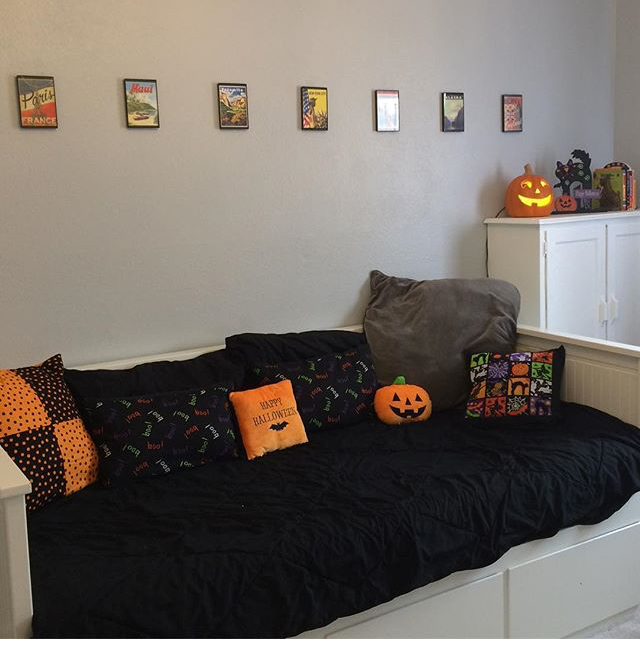 Just enough to get comfortable and read a good book in the fall weather! I love how each room looks and every time I walk into another room it makes me smile and isn’t that the most important thing in the end? 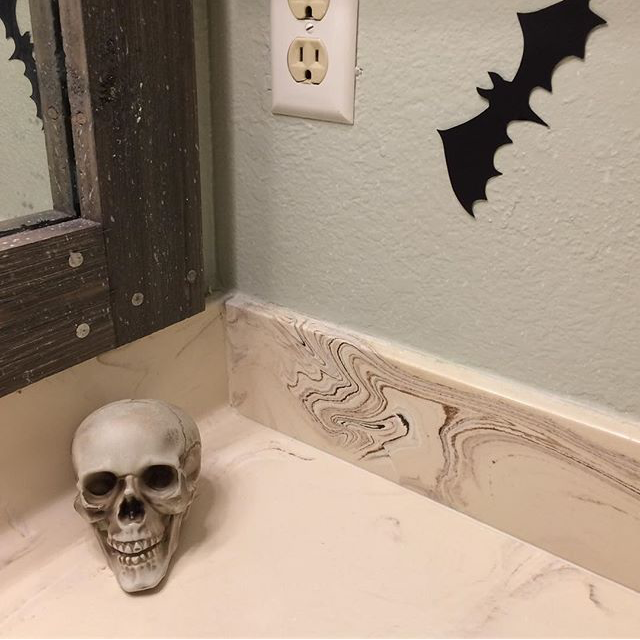 Bring on Halloween! I’m not even going to lie and pretend I enjoyed making this cake. Wedding cakes make me all sorts of nervous. It is someone’s big day and you are responsible for making a huge focal point of the wedding. To top it off this cake was for my good friend and Andrew’s Godmother. Talk about added pressure! It was nice to be able to continue to make all of her cake for her marriage though; I made her bridal shower cake back in July and last month got to make her bachelorette party cake. How cool is that! She wanted to have the wedding cake be carrot cake with pecans instead of walnuts and the same delicious cream cheese frosting as on her other two cakes. The even scarier part of making her wedding cake was that she wanted it to be a naked cake. I love how naked cakes look, but it is something that I am not very good at. I have had problems in the past with the frosting being too thick and tearing the cake, causing crumbs in the supposedly simple pretty cake. 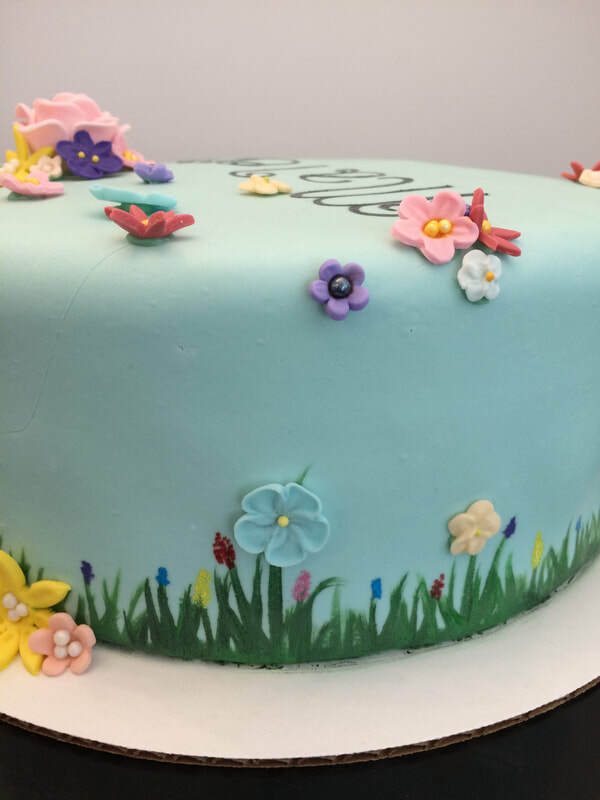 With the lessons I have learned with past naked cakes, I prepared the frosting much thinner to give it a smooth clean finish and thankfully it worked out well. Being honest I still wasn’t happy with the cake though. However, once I added the fresh flowers to the cake during the setup it made the cake look more complete. But then…the cake and the cupcakes I made to go along with the cake were displayed on a table in front of a beautiful old window that was used as a room divider giving it a 360-degree view of the cake. There was no way to hide any flaws. To make matters even worse, the wedding and reception were in the morning. Where they placed the cake table was in the direct sunlight, something they normally don’t have a problem with afternoon weddings. The sunlight light started to warm up the filling in the cake causing it to sink. My heart broke. I wanted to cry and no amount of turning, flower placement, or extra support was going to hide it. I was happy that I was able to take a few pictures before the cake started to sink. They also cut the cake before it got even worse! Later the bride told me the cake was perfect and tasted amazing, and in reality, her opinion is the only one that truly matters. As adorable as this caked turned out, it was a mess to make! The inside of the cake was six layers with each layer being a color of the rainbow, filled with white buttercream. Once all of the layers were stacked, I covered the cake in a thick layer of buttercream and slowly sprinkled rainbow nonpareil sprinkles on the buttercream. This was a huge mess and I am going to find these little round sprinkles for weeks! The trick I quickly learned was to place a large round cake pan under the cake to catch all of the sprinkles that didn’t attach to the cake. Also slightly tilting the cake with one hand and using the other to pat the sprinkles into place helped more to adhere. After several layering of sprinkles, I moved on to making the rainbow for the top of the cake. I used 20 gauge jewelry wire and formed an elongated “U” shape. I then covered the curve of the “U” part of the wire with purple fondant. The second layer I just used a little sugar water to “glue” the blue fondant to the purple. I repeated this proves until I had all the colors of the rainbow. The two long ends of the wire were pushed into the cake. I added a few small skewers to help hold the rainbow upright. I covered the skewers with white buttercream, piping it to look like white fluffy clouds. I finished the cake by piping more clouds all over the top of the cake. There was even a sweet little matching smash cake that looked like a giant cupcake for this sweet little rainbow baby’s birthday! This seemingly simple cake packs a huge punch in flavor! The cake was for my friend’s bachelorette party and I was excited to make the cake for it. Last month I made her bridal shower cake and next month I get to make her wedding cake! I didn’t want to repeat flavors of her other cakes and ended up going with a French vanilla bean cake, cream cheese frosting and sliced fresh strawberries for the filing. 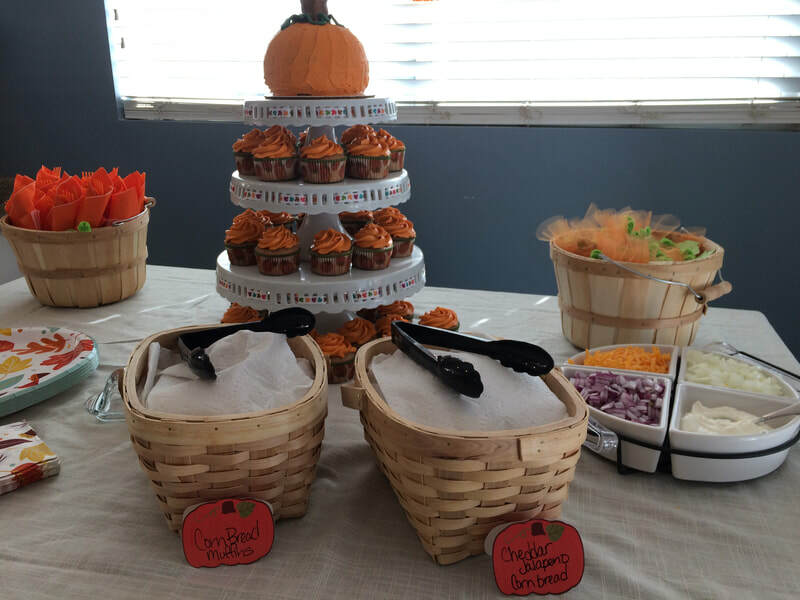 The decoration was kept very simple with just frosting and some gold nonpareils and finished off with sparkly gold ribbon to match the other party decor. I think this might just be my favorite bridal shower cake ever! It was for my very good friend and Andrew's Godmother, Alexis. I was so excited that her Maid of Honor asked me to make it, especially since I am already going to be making the wedding cake. Alexis requested a lemon cake with raspberry filling and cream cheese frosting. Now I have never made a raspberry filling and I will have to write about that in another post, but thankfully it came out and the cake was DELICIOUS! This was also the first time that I ever made a cake tier completely covered in sprinkles, none the less sprayed in edible gold paint and glitter. The top tier was much more challenging than I anticipated. I started off using simple syrup and slowly sprinkled on the smallest sized sprinkles. After letting it sit for a few minutes, I added the largest sized sprinkles and placed in the fridge for a few hours. When the cake was ready to handle I was able to lean the cake over a little and sprinkled on medium sized sprinkles in any spots that needed it. Later I sprayed the whole tier with edible gold spray paint and then added the edible gold glitter with a brush. 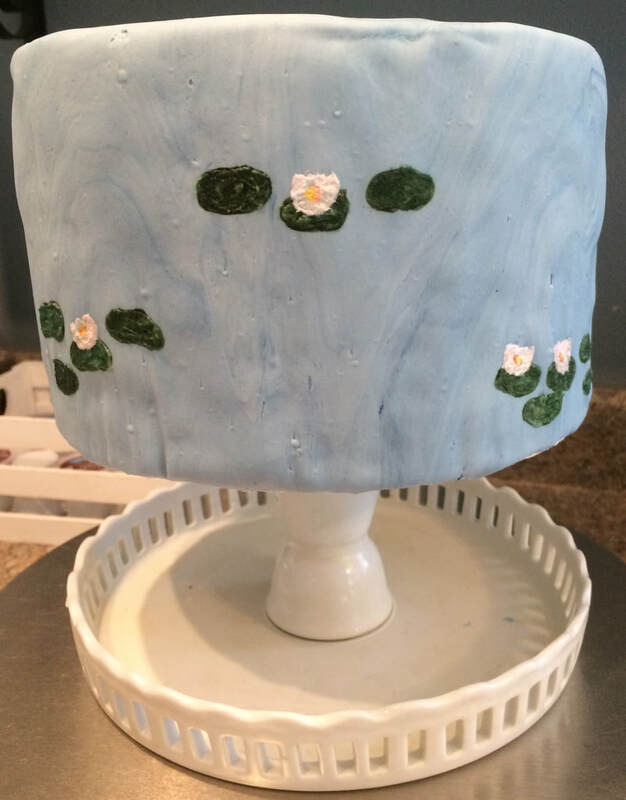 ​To complete the cake I added flowers that matched the shower decor, which hid any flaws in the black ribbon. At the shower, I was able to place the cake on the cake stand and top it off with the Mr. & Mrs. banner topper. Everyone loved the cake, especially the maid of honor and the bride! I think this is my new favorite dessert I have ever made! I am a huge fan of Alton Brown's show Good Eats. I have seen every episode and have made several of his recipes, but this one takes the cake. Literally. 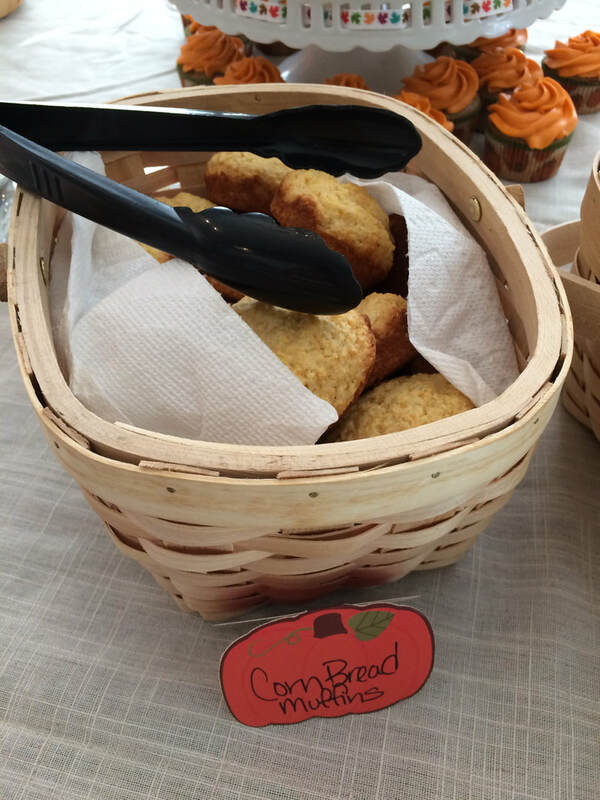 This is his recipe that I used, but the pictures are mine. If you want to try this amazing cake follow the instructions below and be prepared to be amazed! This cake needs to be started at least 24 hours before enjoying. Use either a baking spray or lightly oil and flour a 13 by 9-inch metal pan and set aside. Place the butter into the bowl of a stand mixer. Using the paddle attachment, beat on medium speed until fluffy, approximately 1 minute. Decrease the speed to low and with the mixer still running, gradually add the sugar over 1 minute. Stop to scrape down the sides of the bowl, if necessary. Add the eggs, 1 at a time, and mix to thoroughly combine. Add the vanilla extract and mix to combine. Add the flour mixture to the batter in 3 batches and mix just until combined. 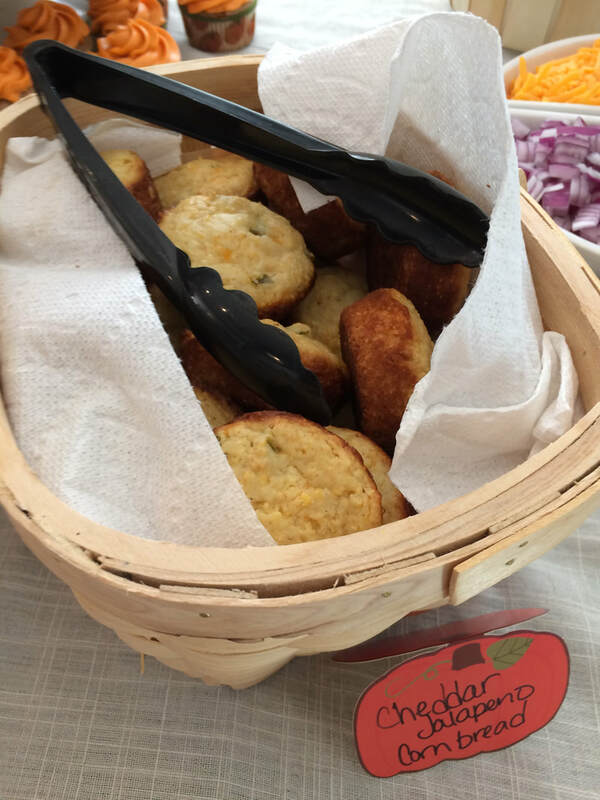 Transfer the batter to the prepared pan and spread evenly. This will appear to be a very small amount of batter. 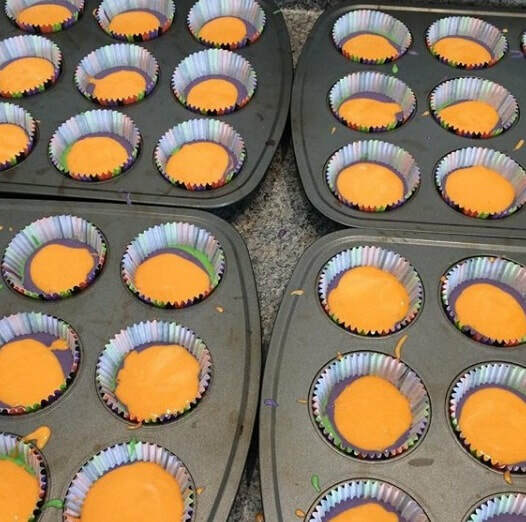 ​Bake on the middle rack of the oven for 20 to 25 minutes or until the cake is lightly golden and reaches an internal temperature of 200 degrees F. Remove the cake pan to a cooling rack and allow to cool for 30 minutes. To make the glaze whisk together the evaporated milk, sweetened condensed milk and the half-and-half in a 1-quart measuring cup. Once combined, pour the glaze over the cake. Refrigerate the cake overnight. Remove the cake from the refrigerator and make the topping by pouring the heavy cream, sugar, and vanilla into the bowl of a stand mixer. Using the whisk attachment, whisk together on low until stiff peaks are formed. Change to medium speed and whisk until thick. 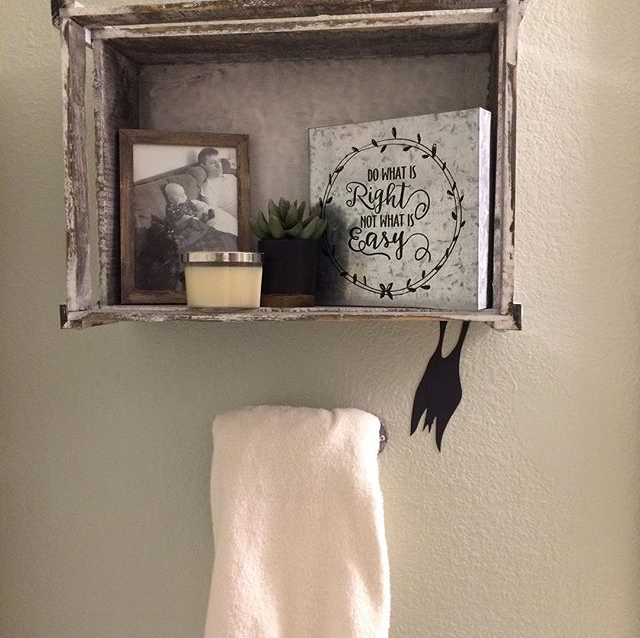 Farmhouse style continues to be the latest trend in home decor. I’m convinced it’s because of Chip and Joanna Gaines on Fixer Up. 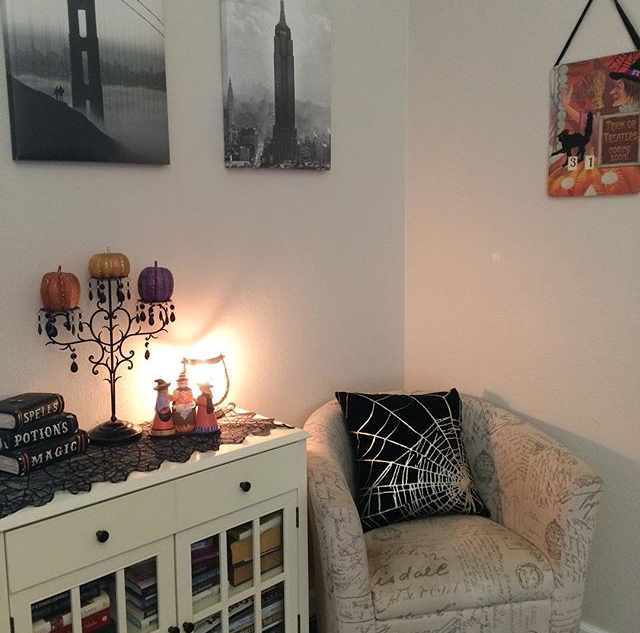 The style is a little vintage, comfortable, relaxing and homey. 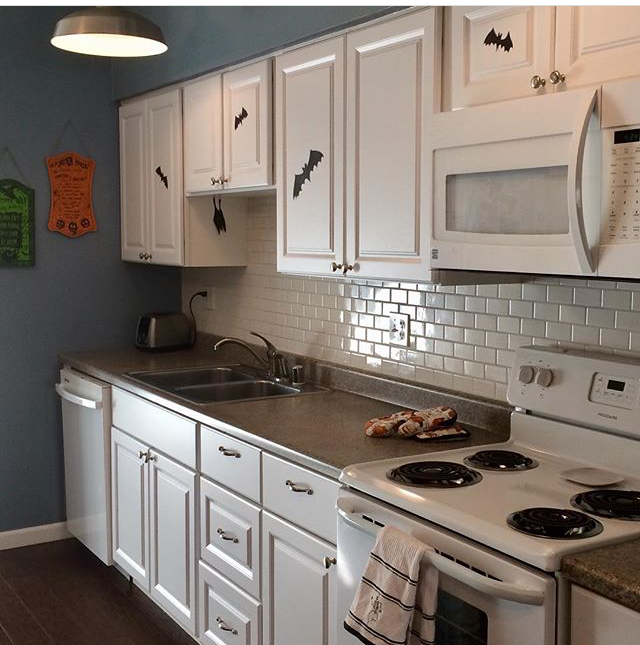 However, a downside of this trendy trend is that most of the decor is pricey and is pretty all much the same. What I personally like about the farmhouse style is that it's supposed to be unique vintage finds, but that’s just not the case anymore. Last month I made a couple of vintage farmhouse style signs for my mom and Aunt using real barn board from my late grandmother's barn. 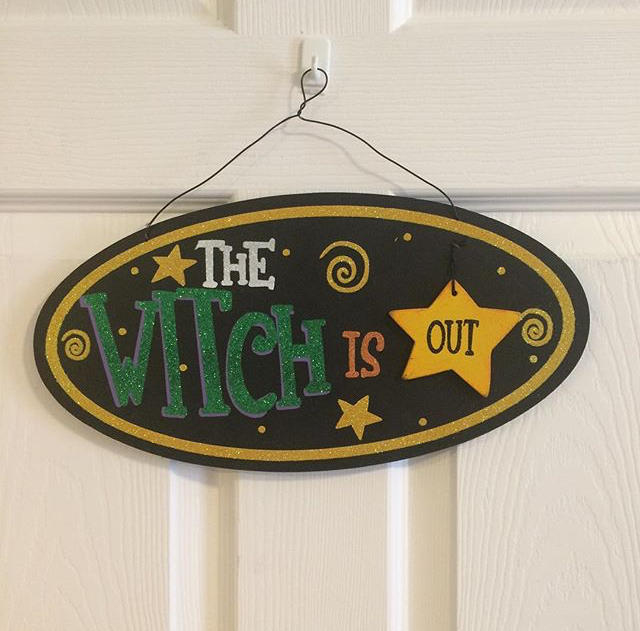 I loved how well theirs turned out that I decided to make me a sign as well. I remembered seeing a couple of eat, drink and be thankful signs in the stores and I decided to make me a sign with that but with a twist. 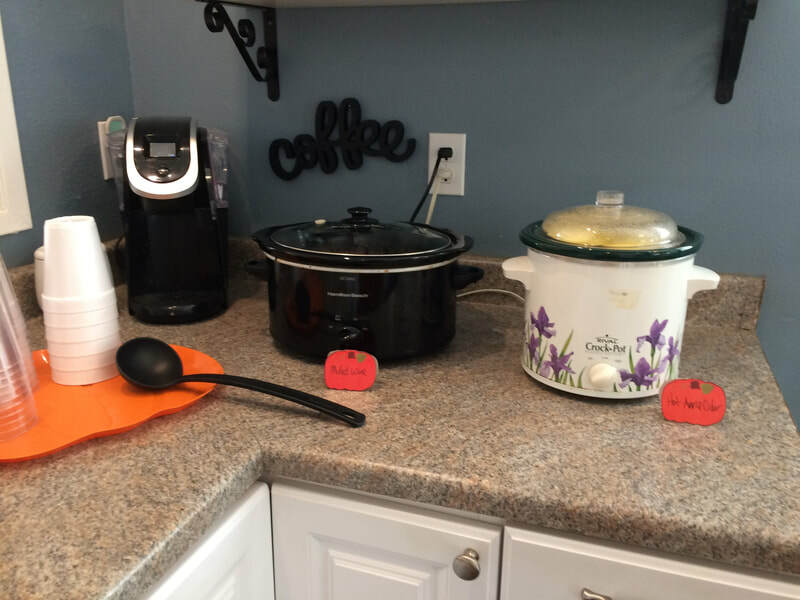 One of the biggest things my family has been working on daily is to bless our food before we eat. This isn’t something Jack was raised with and I was, every night around the dinner table we would hold hands a pray. Sitting at the table is something that we had reimplemented last year when I was pregnant. Now we were working on blessing the food before we ate as a way to express our gratefulness. I added “Pray” to the saying for my farmhouse sign. 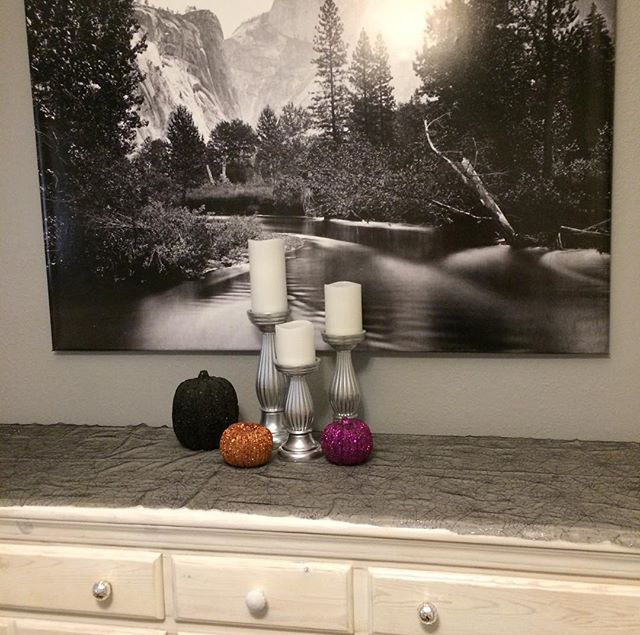 I started by using leftover stain from the dresser project to color the sanded down the wooden board. While that was drying I printed out the words and a simple outline of silverware using regular payer and then traced the images into the wood. The marks from the pencil made groves into the wood since it was soft enough. Using a fine point paint brush I slowly painted all of the letters and silverware with gray paint. Because of the fine details and the residual numbness in my hand, this took me several hours for me to finish. The last step was to seal the sign with a clear coat sealant and add a picture hook on the back. 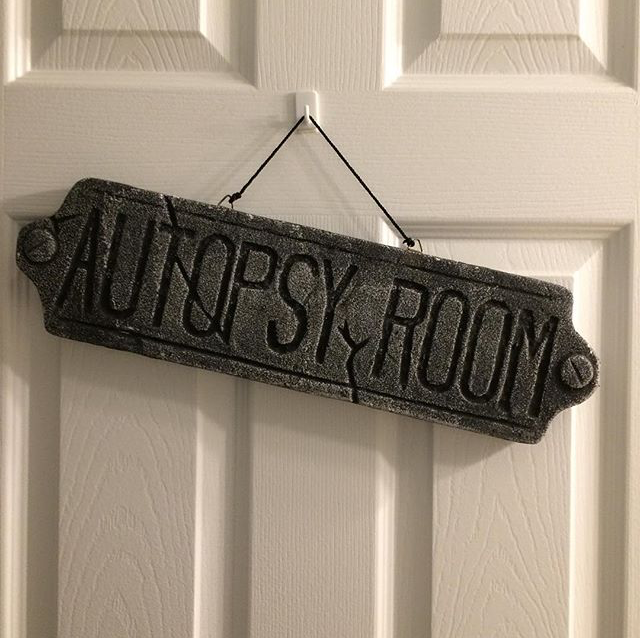 ​The sign came out so great and not only is it one of a kind but a great reminder of what should happen around the dinner table! Last month Jack and I visited my grandmother’s house, somewhere I haven’t been to since she passed away years ago. The purpose of the visit was to collect some boards from the barn in the back of the property for a few projects that I’ve wanted to do. Her barn was a special place for me growing up, there were so many summers that I would play in there with friends, or see the new baby farm animals, I even learned to milk a cow in that barn! I wanted a piece of the barn to always remind me of my wonderful childhood there. I have a few projects planned, but the first one I started with a Mother’s Day gift for my mom. The barn was her mother’s and I wanted to make a sign for her home. I decided to go with “Amazing Grace”, I’m not even sure why I decided on that phrase other than it spoke to me. It also reminded me of how much I loved to sing that hymn as a child in church. After sanding the board smooth, I painted it using watered down grey acrylic paint. While the barn board was drying I typed out the phrase in the size and font that I wanted. It took several pieces of paper that I trimmed down but did not fully cut out all of the letters. Instead, I taped the paper together and then on the dried board and traced each letter using a pencil. The pressure from the pencil created groves for me to use as an outline for the paint. I used white acrylic paint and a fine point paintbrush to paint the letters. Once the paint was dried I sealed it using a clear paint sealant and added two hanging hooks on the top of the barn board. ​I can’t wait to give it to my mom on Mother’s Day. I know she is going to love it as much as I do! This was a really fun cake to make and it was for a really special occasion. The cake was to celebrate a very special high school graduate who won a college scholarship from the local PFLAG chapter. I have done several cake for the person who requested it, so all she asked specifically for was it to include a graduation cap and the PFLAG logo, the rest of the design was for me to create. I've done graduation caps before usually made from fondant and rice crispy treats, so I wanted to try something different. I thought it would be cool if I turned the top tier into the cap. I carved a dome out of the 6" cake and covered it in chocolate black fondant. To create the square, I just covered a piece of cardboard with the same fondant, sorry I'm not experienced enough to make it only out of gum paste. I used buttercream and a skewer to hold the top in place. The bottom tier was a simple white fondant cake and added the logo using letter cutouts and then rolled out red and orange fondant for the triangle and heart shapes. I used the same letter cutouts for the rainbow-colored congratulations and then different stars for the rainbow of stars. To complete the cake I used rainbow rolled out fondant to create the colorful tassel. ​The chapter loved the cake and the winner of the scholarship was so surprised they won! I'm going to have to keep this design in mind for future graduation cakes since it is so awesome looking!! I love doing the not so typical cake for baby showers, gender reveals, and weddings. This Dragon Ball Z cake definitely is not the normal baby shower cake and it could of not turn out any cooler! It was a simple two-tiered cake. The top layer was covered in royal blue fondant and I cut the shape of the logo out in black chocolate fondant and then using a print out of the logo used an X-ACTO knife to cut out each layer and placed it on the black fondant. The bottom tier was covered in red fondant and I used a round cookie cutter to make the circles for the dragon balls and sprayed them with edible gold paint, lastly adding small red stars to finish them off. After taking off a year of decorating cakes because of Andrew, this cake was a fun one to get back in the swing of things! 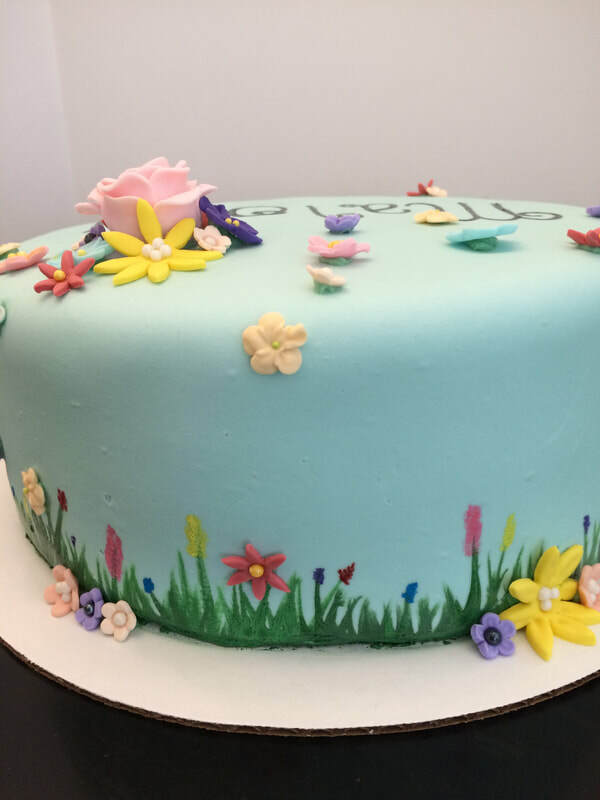 To relaunch my bakery I decided to run a giveaway and by chance, cousin won a discounted cake just when she needed one for her son's birthday. The party theme was Star Wars, which I happen to love since I am geeky and I haven't done one in while. With me being home all day with Andrew, I knew I was going to have to prepare what I could when he allowed me to. 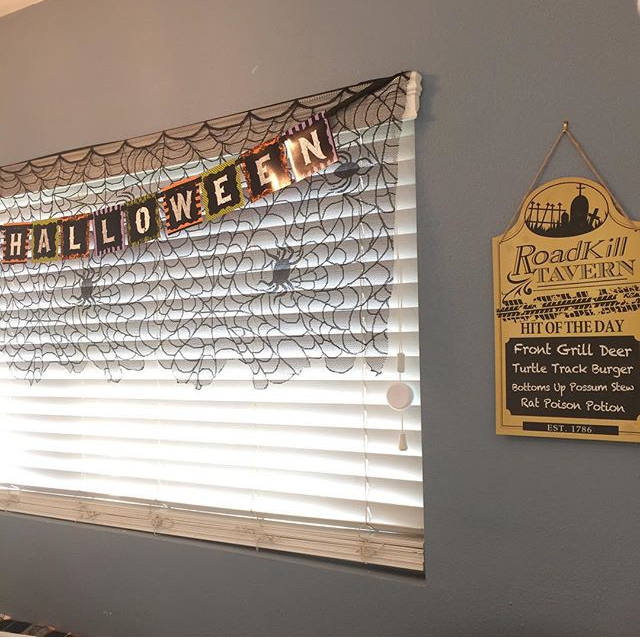 I did most of the decorating in the morning while Jack was able to watch him and I could just focus on finishing it in time for us to leave for the party. I made a chocolate fondant to color black so I wouldn't have to use so much food coloring, plus it tastes delicious! 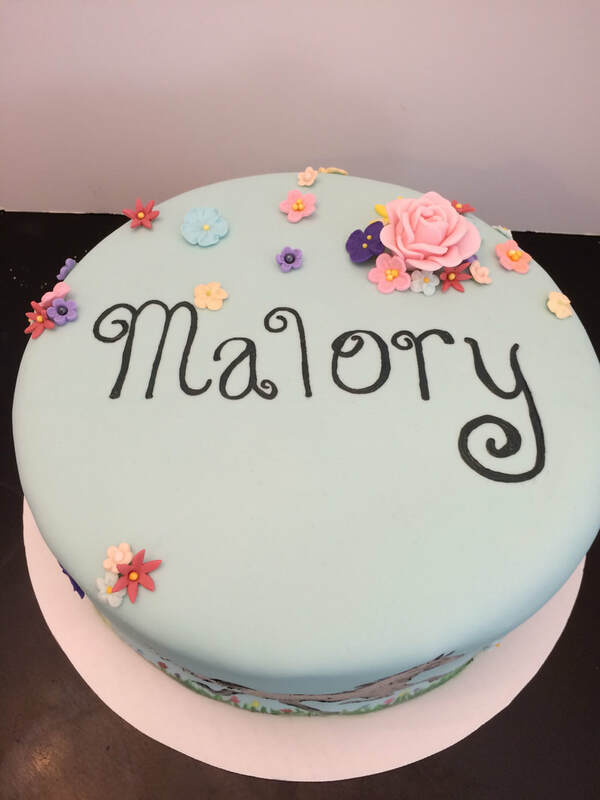 The lettering I found an image on Google and used it to trace it on the white fondant using an X-ACTO knife. I cut out the shapes for the Stormtrooper free hand, but referencing an image, and lastly, the lightsabers were rolled out colored fondant that I sprayed the handles silver and added colorful buttons. I finished the cake off with some stars using different size cookie cutters. 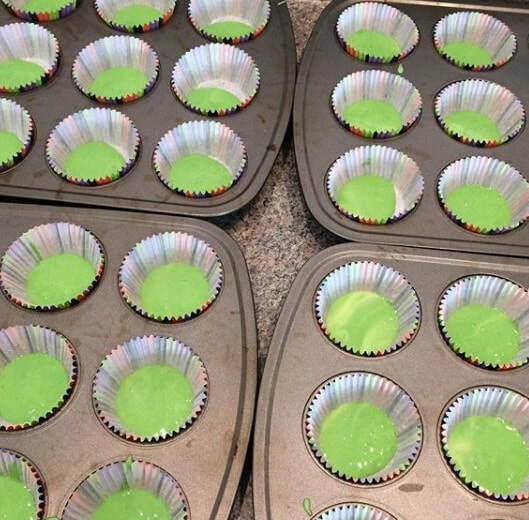 There is nothing like a good pot of Corned Beef and Cabbage or Mint Brownies to go with a pint of Guinness, but when you are in a rush and need a quick appetizer or even a healthy snack for your little one on St. Patrick's Day, this one can be made in under five minutes. All you need is a green vegetable: celery, broccoli, cucumber, etc, carrots and a white dip: ranch, onion dip, cream cheese, etc. Start by placing the white colored dip in a bowl, preferably square or rectangle to create the center of the Irish flag, you don't have to use a bowl at all if you mind the dip running into the vegetables. 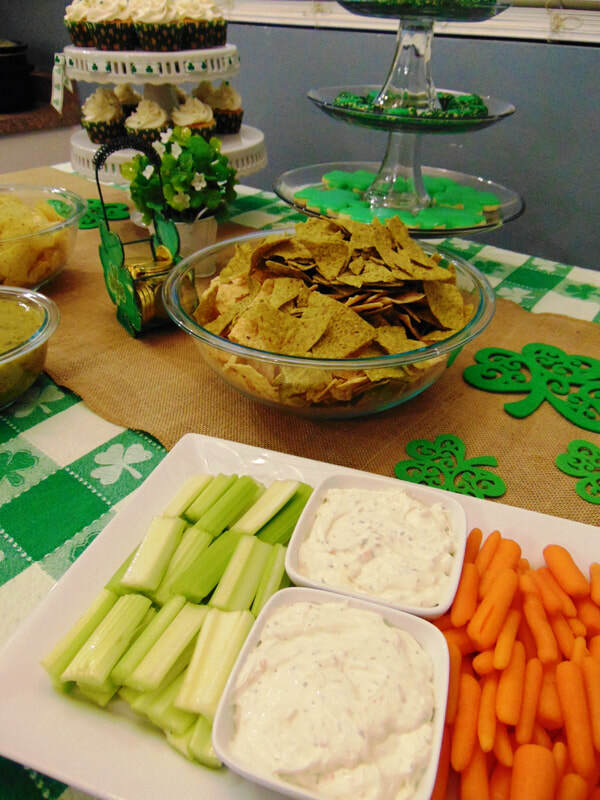 Next, place the carrots on the right side of the dip and finish the flag with the sliced green veggies on the left. 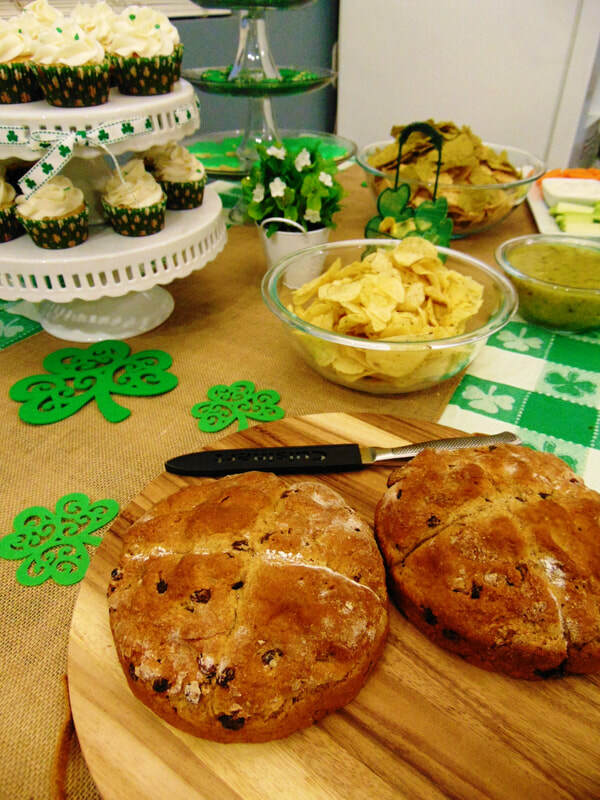 This simple snack was a big hit at our annual St. Patrick's Day party and it was the easiest thing to make! Win, Win! !